AVO reported that the rate of small earthquakes in the vicinity of Redoubt's summit approached background levels during 7-11 April. Gas measurements on 8 April were consistent with a passively degassing and cooling lava dome. The Volcano Alert Level was lowered to Normal and the Aviation Color Code was lowered to Green on 12 April. Major eruptions took place at Redoubt between 15 March and 4 April 2009 (BGVN 34:04) (figure 22-24). Subsequent to those eruptions, through mid-May 2009, the lava dome continued to grow. That growth was often associated with occasional rockfalls, and small plumes, some of which contained ash and sulfur dioxide. The eruption had significant economic impacts including to the aviation industry (BGVN 34:04). The current report summarizes activity from mid-May to 30 June 2009. Figure 22. View of the face of Redoubt taken on 2 July 2009. Courtesy of AVO/USGS and Cyrus Read. Figure 23. Redoubt fall deposit laid down on 23 March 2009. Taken at station RDW-C in July 2009. Courtesy of AVO/ADGGS and Kate Bull. Figure 24. View looking towards Redoubt, 1 July 2009. Courtesy of the AVO/ADGGS and Kate Bull. Alaska Volcano Observatory (AVO) reported seismicity from Redoubt during 13 May to 23 June 2009 remained above background levels. Signals disclosed rock avalanches, discrete earthquakes. Minor volcanic tremor continued. Growth of the lava dome in the summit crater (figure 25) continued, and by 15 May the dome's volume was an estimated 30-60 million cubic meters. By 12 June, the dome was an estimated 1 km long, 460 m wide, and 200 m high. AVO warned that the unstable lava dome could fail with little or no warning, leading to significant ash emissions and possible lahars in the Drift River valley. Occasional rockfalls originating from unstable slopes of the lava dome produced minor ash clouds near the summit. Figure 25. A series of Forward Looking InfraRed (FLIR) thermal images showing the Redoubt dome's gradual cooling. The new dome has been extruding since 4 April 2009. Temperature scales are at right. Note the average temperature of the rubbly area between the vent at the top of the dome and the block top at the N base of the dome (circle) varied between -1.0 to 1.4°C. Courtesy of AVO/USGS and Rick Wessles. Vigorous steam emissions from the margins of the lava dome were seen on the web camera. At times, incandescence was observed in nighttime images. During an overflight on 16 May, scientists observed a turquoise lake along the S margin of the dome, and a hot, vigorous, persistent fumarole on the W wall of the upper gorge. By late June 2009, AVO reported declining seismicity. The lower seismicity and gas emissions, along with occasional observations, suggested that dome growth had significantly slowed. On 30 June, AVO lowered the Alert Level to Advisory and the Aviation Color Code to Yellow. Aviation encounter on 26 March 2009. The Montreal VAAC received news that a plane for a Canadian carrier encountered a volcanic cloud over southern British Columbia, near Kelowna, at approximately 0000 UTC on 26 March 2009. At that time, to the best knowledge of the VAAC, the plume from the initial eruption of Redoubt (23 March) consisted of considerable amounts of SO2, but no ash. A full inspection of the plane found no ash. Information Contacts: Alaska Volcano Observatory (AVO), a cooperative program of a) U.S. Geological Survey, 4200 University Drive, Anchorage, AK 99508-4667, USA (URL: http://www.avo.alaska.edu/), b) Geophysical Institute, University of Alaska, PO Box 757320, Fairbanks, AK 99775-7320, USA, and c) Alaska Division of Geological & Geophysical Surveys, 794 University Ave., Suite 200, Fairbanks, AK 99709, USA; Associated Press (URL: http://www.ap.org/); Dov Bensimon, Montréal VAAC, 2121 North Service Road, Trans-Canada Highway, Dorval, Quebec H9P 1J3, Canada. AVO reported that a series of small repetitive earthquakes in the vicinity of Redoubt's summit were detected on 5 April. The Volcano Alert Level was raised to Advisory and the Aviation Color Code was raised to Yellow. On 5 January, AVO reported that because of low levels of seismic activity from Redoubt, along with the lack of any other outward signs of progressing unrest, the Volcanic Alert Level was lowered to Normal and the Aviation Color Code was lowered to Green. AVO reported that during 27-28 December seismic activity from Redoubt changed from the pattern noted during the previous five months, and was characterized by a series of small repetitive earthquakes that occurred in the vicinity of the summit. The Volcanic Alert Level was raised to Advisory and the Aviation Color Code was raised to Yellow. Based on pilot reports and web camera views, no unusual activity or plumes were noted. On 29 September, AVO reported that seismic activity from Redoubt, along with volcanic gas output, ground deformation, lava dome temperatures, and outward signs of lava dome instability, have been declining during the previous several months. The Volcanic Alert Level was lowered to Normal and the Aviation Color Code was lowered to Green. AVO reported that during 24-29 June seismicity from Redoubt was low, but remained above background levels. Web camera images showed continued steaming from the lava dome at the summit. No ash signals were observed in radar or satellite imagery. Occasional observations, the low level of seismicity, and low gas emissions suggested that the growth of the lava dome had significantly slowed. On 30 June, AVO lowered the Volcanic Alert Level to Advisory and the Aviation Color Code to Yellow. Seismicity at Redoubt, as reported by AVO, was low during 17-23 June, but remained above background level. Seismicity was primarily comprised of small, discrete events associated with continued growth and instability of the lava dome. Webcam images on 19 and 23 June showed continued steam and gas emissions from the dome. Poor weather conditions throughout the week limited fieldwork opportunities, but one crew was able to observe the dome on 15 June. The Volcanic Alert Level remained at Watch and the Aviation Color Code remained at Orange. AVO reported that during 10-15 June seismicity from Redoubt remained low, but above background levels; small discrete earthquakes in the summit region associated with dome growth and instability were recorded. Clear web camera views on 10, 11, and 16 June showed steaming from the summit region. On 12 June, the lava dome was an estimated 1 km long, 460 m wide, and 200 m high. The Volcanic Alert Level remained at Watch and the Aviation Color Code remained at Orange. AVO reported that during 3-9 June seismicity from Redoubt remained low, but above background levels; small discrete earthquakes and rockfall signals in the summit region were recorded. Growth of the lava dome in the summit crater continued and by 5 June extended 950 m down the N flank. Cloudy conditions often obscured satellite and web camera views; steaming from the summit region was seen periodically. On 3 June, a minor dusting of ash was visible on the NE flank, likely related to rockfall activity. AVO warned that the unstable lava dome could fail with little or no warning, leading to significant ash emissions and possible lahars in the Drift River valley. The Volcanic Alert Level remained at Watch and the Aviation Color Code remained at Orange. AVO reported that during 27 May-2 June seismicity from Redoubt remained low, but above background levels; small discrete earthquakes and rockfall signals in the summit region were recorded. Growth of the lava dome in the summit crater continued. Cloudy conditions obscured satellite and web camera views. AVO warned that the unstable lava dome could fail with little or no warning, leading to significant ash emissions and possible lahars in the Drift River valley. The Volcanic Alert Level remained at Watch and the Aviation Color Code remained at Orange. AVO reported that during 20-26 May seismicity from Redoubt remained above background levels and growth of the lava dome in the summit crater continued. Steam-and-gas emissions from the lava dome were seen on the web camera during 20-21 and 26 May; clouds obscured the view during the rest of the reporting period. Occasional rockfalls originating from unstable slopes of the lava dome possibly produced minor ash clouds in the vicinity of the summit, although no ash was detected by satellite or radar. The Volcanic Alert Level remained at Watch and the Aviation Color Code remained at Orange. AVO reported that during 13-19 May seismicity from Redoubt had decreased from levels detected during 2-7 May, but remained above background levels. Rock avalanche events, discrete earthquakes, and minor volcanic tremor were evident in seismic data. Growth of the lava dome in the summit crater continued and vigorous steam emissions from the margins of the lava dome were seen on the web camera. Occasional rockfalls originating from unstable slopes of the lava dome produced minor ash clouds in the vicinity of the summit. Occasional incandescence was observed in nighttime images from the web camera. On 15 May, the volume of the dome was an estimated 30-60 million cubic meters. During an overflight on 16 May, scientists observed a turquoise lake along the S margin of the dome, and a hot, vigorous, and persistent fumarole on the W wall of the upper gorge. The Volcanic Alert Level remained at Watch and the Aviation Color Code remained at Orange. During 29 April-5 May, AVO reported that elevated seismicity from Redoubt and a persistent thermal anomaly over the summit lava dome detected on satellite imagery were consistent with continued lava-dome growth. Changes in the size and shape of the dome confirmed growth; the volume of the dome was an estimated 25-30 million cubic meters. Occasional small rock avalanches originating from the N side of the lava dome produced minor low-level ash emissions. The web camera showed steam-and-gas plumes rising from the lava dome. During 2-3 May, seismicity increased markedly and minor ash emissions were seen on the web camera. More frequent rockfalls were also detected. On 4 May, steam plumes with possible minor amounts of ash rose several thousand feet above the summit and drifted SE. Seismicity during 4-5 May continued to slowly increase. AVO warned that a significant explosive event was likely in the coming days. AVO reported that during 22-28 April seismicity from Redoubt remained above background levels, indicating ongoing growth of the lava dome in the summit crater. On 22 April, the web camera showed steam-and-gas plumes that may have occasionally contained small amounts of ash rising from the lava dome. Views during 23-28 April were prevented by meteorological clouds. Pilots reported sulfur odors to the NE on 22 April and to the S on 28 April. The Volcanic Alert Level remained at Watch and the Aviation Color Code remained at Orange. AVO reported that during 15-21 April seismicity from Redoubt remained above background levels, indicating ongoing growth of the lava dome in the summit crater. The web camera showed that vigorous steam-and-gas plumes that may have occasionally contained small amounts of ash rose from the vent to altitudes below 4.6 km (15,000 ft) a.s.l. Analysis of satellite imagery revealed thermal anomalies at the summit and drifting sulfur dioxide plumes. Based on photos and thermal images obtained on 16 April, the lava dome was estimated to be about 500 x 700 m across and at least 50 m thick. The Volcanic Alert Level remained at Watch and the Aviation Color Code remained at Orange. Based on seismic data and satellite imagery, AVO reported that Redoubt's lava dome continued to grow during 8-14 April. On 8 April, a small steam plume possibly containing ash was seen on satellite imagery and on the web camera, and drifted NE at low altitudes. A continuous sulfur dioxide plume seen on satellite imagery drifted 965 km. On 9 April, RADAR data showed no significant ash emissions. An M 3.3 earthquake was located about 4 km ENE of the summit. Observations showed that the lava dome grew in the same location as the previous lava dome, was circular in shape, and 400 m in diameter. A report on 10 April indicated that seismicity had remained steady since the last explosion on 4 April; small repetitive volcanic earthquakes were detected. Gas, steam, and ash emitted from the vent formed a plume that rose to an altitude less than 4.6 km (15,000 ft) a.s.l. On 11 April, A vigorous steam plume that may have contained small amounts of ash was visible on the web camera. Satellite imagery showed a plume that drifted NW at altitudes below 6.1 km (20,000 ft) a.s.l. Observations on 13 and 14 April were obscured by clouds. The Volcanic Alert Level remained at Watch and the Aviation Color Code remained at Orange. During 1-3 April, AVO reported that Redoubt continued to emit steam, gases, and minor amounts of ash visible on the Redoubt Hut web camera. On 1 and 2 April, satellite images showed a plume containing some ash extending about 65 km ENE at altitudes of 4.6-7.6 km (15,000-25,000 ft) a.s.l. Thermal anomalies detected in infrared images were most likely due to lava dome extrusion in the summit crater. On 3 April, AVO lowered the Volcanic Alert Level to Watch and the Aviation Color Code to Orange due to a decreased intensity of ash production. AVO overflights and photography confirmed that a lava dome was growing at the summit. Occasional avalanches of hot blocks from the dome traveled a short distance down the N flank. On 4 April, a significant explosion produced an ash plume that rose to an altitude of 15.2 km (50,000 ft) a.s.l. and drifted SE. Seismic data indicated that a lahar traveled down the Drift River valley. AVO raised the Alert Level to Warning and the Aviation Color Code to Red, the highest levels. During 5-6 April, small earthquakes and intermittent tremor continued to be detected. The web camera showed a continuously emitted plume of primarily steam and gas that rose to an altitude of 7.7 km (25,300 ft) a.s.l. and drifted SE. A small, intermittent plume rose from the NW base of the volcano, possibly from the interaction of hot debris with snow, ice, and water. On 6 April, AVO again lowered the Volcanic Alert Level to Watch and the Aviation Color Code to Orange due to seismic patterns and emissions of only very minor ash. A gas-and-steam plume rose to an altitude less than 7.7 km (25,300 ft) a.s.l. and drifted NE. On 7 April, a small steam-and-ash plume was seen on satellite imagery and drifted 16-24 km SE at altitudes of 4.6-6.1 km (15,000-20,000 ft) a.s.l. On 25 March, AVO reported that a small explosion from Redoubt produced an ash plume that rose to an altitude of 4.6 km (15,000 ft) a.s.l. and drifted N to NW. Later that day AVO lowered the Volcanic Alert Level to Watch and the Aviation Color Code to Orange because seismicity had decreased during the previous 36 hours. On 26 March, multiple explosive eruptions produced plumes to altitudes of 6.1-19.8 km (20,000-65,000 ft) a.s.l. or greater. AVO raised the Alert Level to Warning and the Aviation Color Code to Red, the highest levels. The largest eruption, at 0924, also produced a lahar in the Drift River valley that was detected by seismic instruments. During 27-28 March, seven explosive eruptions produced ash plumes to altitudes of 7.6-15.2 km (25,000-50,000 ft) a.s.l. An ash plume on 29 March rose to an altitude of 6.1 km (20,000 ft) a.s.l. Seismic and infrasound data did not show clear evidence that the plume was generated by an explosion. On 30 March, continuously emitted ash plumes of varying intensities were observed in a web camera, on satellite and radar images, and by pilots, and rose to altitudes less than 6.1 km (20,000 ft) a.s.l. Occasionally, short-lived events produced ash plumes to an altitude of 8.2 km (27,000 ft) a.s.l. A thermal anomaly at the vent seen on satellite imagery was possibly due to the extrusion of a lava dome in the summit crater. On 31 March, emissions of steam, gas, and minor amounts of ash were seen on Redoubt Hut web camera. Resultant plumes rose to altitudes of 4.6-7.6 km (15,000-25,000 ft) a.s.l. Satellite images showed a broad layer of volcanic haze that extended E over the Kenai Peninsula, the Anchorage Bowl, and the Matanuska-Susitna Valley. According to news articles, 11 people were evacuated on 23 March from the Drift River Terminal, an oil storage facility about 35 km ENE of Redoubt that shut down because of the eruption. During 24-28 March, flights in and out of Anchorage and other local areas continued to be canceled or diverted; as many as 185 Alaska Airlines flights had been canceled since the beginning of the eruption. Ashfall was occasionally reported in Anchorage and areas NW. On 18 March, AVO lowered the Alert Level for Redoubt to Advisory and Aviation Color Code to Yellow because seismicity declined to levels recorded prior to the ash emission on 15 March. Seismicity remained low the next day. Shallow earthquake activity was noted again on 20 March. On 21 March, a steam plume rose to an altitude of 3.4 km (11,200 ft) a.s.l. Later that day, the rate of seismic events continued to increase, prompting AVO to raise the Alert Level to Watch and the Aviation Color Code to Orange. On 22 March, an explosive eruption began at 2238, prompting AVO to raise the Alert Level to Warning and the Aviation Color Code to Red, the highest levels. Four more explosive eruptions occurred, with each lasting between 4-30 minutes. Ash plumes rose to an altitude of 18.2 km (60,000 ft) a.s.l., with the bulk of the ash volume between 7.6-9.1 km (25,000-30,000 ft) a.s.l. Ashfall was reported in areas 190-250 km NE. The last explosion ended at 0500 on 23 March. No ash was detected afterwards utilizing radar data, suggesting that if ash emissions were occurring, plumes would be below approximately 4 km (13,000 ft) a.s.l. and/or contain particles too fine to be detected. Poor weather hindered visual observations of the volcano. The sixth explosion began on 23 March at 1941, lasted about 17 minutes, and produced an ash plume that rose to an altitude of 15.2 km (50,000 ft) a.s.l. and drifted W and N. Pyroclastic flows were visible traveling down the N flank in web camera images. According to news articles, Alaska Airlines cancelled 19 flights on 23 March due to ash plumes. On 23 March, AVO staff visited areas around Redoubt and saw large lahar and flood deposits in the Drift River valley. The eruptions caused melting of the Drift Glacier and greatly increased discharge down the Drift River, causing lahars that traveled more than 35 km, reaching the Cook Inlet. In the middle to upper Drift River valley, high-water marks reached 6-8 m above the valley floor. At the AVO hut (roughly 11 km NNW of the summit), a 6-cm-thick fall deposit was observed. On 24 March, AVO reported that a steam plume rose to an altitude of 6.1 km (20,000 ft) and drifted about 65 km NW. AVO reported that during 11-15 March seismic activity at Redoubt was low but remained above background levels. On 12, 14, and 15 March clear web camera views showed steam plumes that rose just above the summit. At about 1305 on 15 March, seismic activity increased and about four hours of volcanic tremor ensued. AVO scientists aboard an overflight saw a steam-and-ash plume rise to an altitude of 4.6 km (15,000 ft) a.s.l. and produce minor ashfall on the summit crater floor and down the S flank. The emissions originated from a new vent, located just S of the 1990 lava dome and W of the prominent ice collapse feature near the N edge of the summit crater. About twenty minutes later, a sediment-laden flow occurred from a small area in the ice on the upper part of Drift glacier. Steam plumes were later noted. AVO raised the Aviation Color Code to Orange and the Alert Level to Watch. Clear web camera views on 17 March showed no unusual activity. AVO reported that during 4-10 March seismic activity at Redoubt was variable but remained above background levels. Clear web camera views and satellite imagery on 7 and 8 March showed no unusual activity. On 10 March, AVO reported that although abnormally high gas emission rates continued to be detected and melting of the summit glacier was still evident, the new magma beneath the volcano did not show any signs of upward movement. The Aviation Color Code was lowered to Yellow and the Alert Level was lowered to Advisory. AVO reported that during February 25-March 3 seismic activity at Redoubt was variable. On 25 February, a small mud flow originating from a melt hole in the Drift Glacier traveled several hundred meters. Satellite images revealed that the next day another mudflow traveled several kilometers and covered a large portion of the Drift Glacier. Web camera views and satellite imagery showed no unusual activity; steam plumes within the summit crater were seen on the web camera on 26 and 1 March. AVO reported that during 18-24 February seismic activity at Redoubt was variable but remained elevated above background levels. Web camera views and satellite imagery showed no unusual activity; steam plumes within the summit crater were seen on the web camera on 23 and 24 February. AVO reported that during 10-17 February seismic activity at Redoubt was variable but remained elevated above background levels. Web camera views were often obscured by snow, clouds, or ice on the camera housing. On 10 February, scientists noted that the outflow stream on the W side of Drift Glacier was frozen. AVO reported that during 4-10 February seismic activity at Redoubt fluctuated but remained elevated well above background levels. 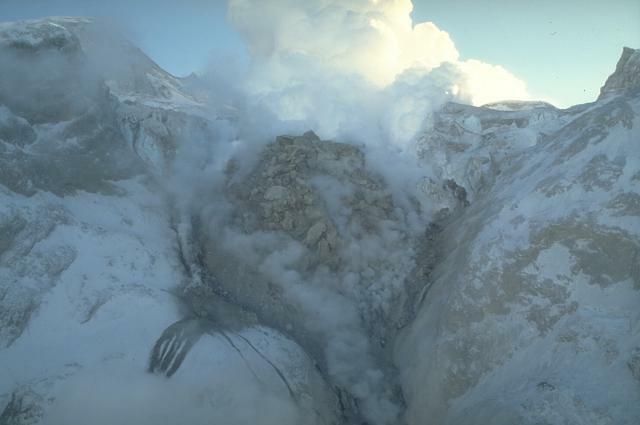 On 7 February, aerial observers reported continued steaming from an area around the 1989-90 lava dome and water discharge along the Drift Glacier. Clear web camera views during 7-9 February showed small steam plumes. AVO reported that during 27 January-3 February seismic activity at Redoubt remained elevated above background levels. On 27 January, observers reported continued muddy discharge from points on the Drift Glacier, below the summit crater. A diffuse steam plume was possibly identified on satellite imagery on 29 January. An overflight the next day revealed increased fumarolic activity, an enlargement of melt features in the summit glacier, and increased runoff from along the margins of the Drift Glacier. During 31 January and 1-2 February, steam plumes were intermittently seen on the web camera rising above the summit. AVO reported that during 24-25 January seismic activity at Redoubt increased markedly. On 25 January, seismic tremor became sustained and amplitude increased notably prompting AVO to raise the Aviation Color Code to Orange and the Alert Level to Watch. During an overflight later that day, observers saw no evidence of an eruption. However, they also noted increased steaming through previously identified sources in the snow and ice cover, along with sulfur gas emissions. An overflight on 26 January revealed elevated sulfur dioxide emissions from the summit and new outflows of muddy debris along the glacier that is downslope of the summit. On 26 and 27 January, seismicity fluctuated but remained above background levels. On 5 November, AVO raised the Aviation Color Code for Redoubt to Yellow and the Volcano Alert Level to Advisory because of significant changes in gas emission and heat output during the previous several months. The changes were a departure from the long-observed background activity. ASTER satellite images from 13 October detected warming near the summit craters; evidence of warming had been directly observed in July 2008. Fumarolic activity and water flowing beneath Drift Glacier on the N flank had produced a 45-m-wide melt or collapse hole at an elevation of about 1,700 m (5,600 ft) on the Drift Glacier. On 2 November, a slushy debris-flow deposit originated from about the location of the 1966-68 vent. During 6-11 November, no activity was observed on satellite imagery and seismicity remained low. AVO reported that on 16 September, a pilot flying downwind of Redoubt reported smelling a strong sulfur dioxide odor. A week later, residents of a cabin near Wadell Lake (25 km NE) reported loud noises coming from the direction of Redoubt. During an overflight on 27 September, scientists observed several fractures and circular openings in the upper Drift glacier that had not been seen before. They also noted that fumaroles atop the 1968 and 1990 lava domes were more vigorous than when last observed in mid-August. A distinct hydrogen sulfide odor was also evident, though no sulfur dioxide was detected by onboard instrumentation. The seismic network at Redoubt did not detect any abnormal earthquake activity. The Volcano Alert Level remained Normal and the Aviation Color Code remained Green. A series of strong explosions began 14 December after about a day of vigorous seismicity. Eruption clouds reached 12 km altitude, and airline pilots later reported ash layers in the atmosphere as far as S Texas (5,000 km from the volcano). Despite warnings from aviation authorities, several aircraft encountered the ash, and one, with 245 persons on board, lost power to all of its engines for 8 minutes before restarting and landing safely. The area immediately around the volcano is thinly populated, but the potential for eruption-induced flooding threatened an oil storage facility and forced the evacuation of most of its personnel. Redoubt was last active from early 1966 until mid-1968, with periods of repeated explosive episodes separated by as much as 8 months of quiet. Pre-eruption seismicity and warnings. An increase in local seismicity to slightly above background level was first noticed 8 December on AVO's five-station seismic array. At about the same time, an apparent flank steam plume was observed from Anchorage, roughly 200 km NE of Redoubt. Seismicity increased somewhat during the morning of 13 December, and more strongly at about 1100 (to about 1-2 low-frequency microearthquakes/minute). AVO notified the Governor's Office, the Alaska Division of Emergency Services, the FAA, and the Drift River oil storage facility (figure 1) of the increased seismicity and expressed concern about (but did not formally forecast) an eruption. AVO's press release, issued at 1600, described the seismicity and noted that "It is impossible to state at this time whether the seismic activity is a precursor to a volcanic eruption, but that is a possibility of some concern." Steps were taken to reduce risk to the Drift River facility (including making oil storage tanks neutrally buoyant) and the FAA issued a warning of possible ash hazard. Figure 1. Sketch map of Redoubt and vicinity. Contour interval is 2,000 feet, about 600 m. Shading darkens with each 2000-foot interval. Courtesy of AVO. Eruption onset, 14 December. About 0700 the next morning, seismic amplitudes on flank instruments decreased slightly, while slightly increased amplitudes were recorded at the summit. At about the same time, a magnitude 4 tectonic earthquake occurred at 80-95 km depth about 40 km S of Redoubt. Strong tremor began at about 1013, indicating the onset of the eruption. Five minutes later a MarkAir pilot reported that an ash column had reached 10.5 km altitude. Winds carried ash NE, with light dustings reported N and W of Anchorage. Within an hour, satellite images showed a plume that extended 156 km from the volcano and was as much as 90 km wide. The cloud top temperature determined from satellite data was about -47°C. Radiosonde data from Anchorage showed a similar temperature at about 9 km altitude. Jet stream winds at that altitude were blowing almost due N (from 190°) at 110-165 km/hour. At 1156, the FAA issued a Notice to Airmen (NOTAM), imposing temporary flight restrictions in the area. During an overflight by AVO geologists that afternoon, steam was rhythmically pulsing from an upper N flank crater, in the same general area as the source of Redoubt's 1966-68 eruption. No ash was visible on the flanks. A helicopter overflight by oil facility personnel revealed evidence that about 15 m of flooding had occurred in the upper Drift River and that the flood was about 12 m high in the lower valley, a few vertical meters from facility equipment (but see 18 December overflight data). Some steaming boulders were observed in the flood debris. That evening, two bursts of seismicity, each lasting about an hour, occurred between 1915 and 2245. The activity was not recorded at the Spurr station, 60 km N of Redoubt, and was not associated with any reported ash emission. Large explosions and aircraft encounter with tephra cloud, 15 December. A sharp seismic pulse, about 1 hour long, was recorded 15 December at 0140. At 0330, satellite data showed an apparent eruption cloud temperature of -30°C, corresponding to an altitude of 6-6.5 km. Between 0300 and 0400, satellite images showed plume movement toward 150° at 66 km/hour, with its leading edge 146 km from Redoubt by 0400. A second sharp seismic pulse, again lasting about 1 hour, began at 0338, but weather clouds obscured satellite observations. 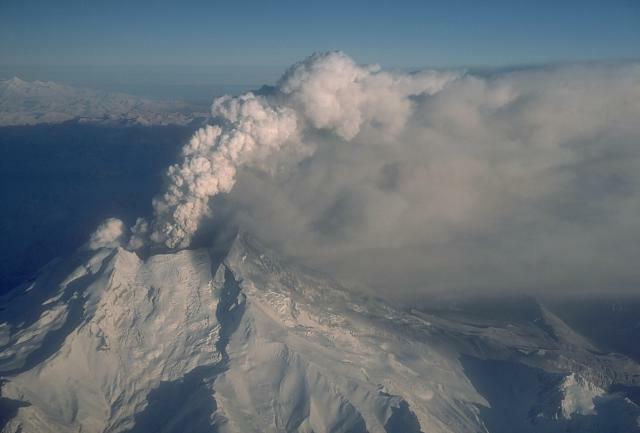 An airplane pilot reported that the ash cloud extended from Redoubt to Talkeetna (about 250 km NE of the volcano). Both seismic episodes were slightly stronger than that associated with the previous day's eruptive episode, and were recorded at the Spurr station. As of 0900, the near-summit seismic station showed continuing moderately strong seismic noise, possibly associated with vigorous steaming or continuing minor ash emission. A powerful explosive episode that ejected a large tephra column was marked by a vigorous pulse of seismicity between about 1017 and 1100 that was the most energetic of the eruption thus far. Airplane pilots reported ash to at least 12 km altitude. A temperature of -45°C was measured in the thickest part of the cloud using satellite data at 1030, but the plume was at the edge of the image, calibration was difficult, and no height estimate was made. Ashfalls from the plume were reported N of the Alaska Range and E to Canada. At 1150, a Boeing 747 jetliner with 231 passengers and 14 crew members encountered the plume at 7.5 km altitude near Talkeetna, about 150 km N of Anchorage. The KLM flight, bound from Amsterdam to Tokyo with a stop at Anchorage, lost power to all 4 engines and descended 4 km before restarting at 1158 and landing safely in Anchorage at 1225. Investigations of the incident continue. Several other, less serious contacts with the plumes by aircraft included a MarkAir Boeing 737 that reportedly required replacement of 2 engines and its windshield. Earthquake activity declined after 1100 for about 8 hours, but remained above previous background levels. Renewed eruptive activity began at about 1900 with continuous ash eruption and sustained high levels of seismicity. Eruption clouds reached about 8.5 km altitude. During the night, satellite images showed a moderate plume, moving about 60 km/hour ESE at about 4.5 km altitude. [See 14:12 for petrographic data and information from reconnaissance studies of avalanche and lahar deposits]. Sustained eruptive activity, 16-19 December. Another strong eruptive pulse was recorded on 16 December at 0620. Pilots reported ash to 9-10.5 km altitude over and W of Anchorage, and by 0900 satellite images showed a plume as much as 160 km wide with its front 660 km ESE of the volcano. Most of the activity 16-18 December was characterized by apparently continuous low-level ash emission, generally to less than 5 km altitude, occasionally punctuated by explosions that ejected ash to 7.5-9 km. Pilots reported an eruption 17 December at 1300, with ash reaching 8.5 km altitude. Seismicity increased after 0300 on 18 December and plumes rose to 6-9 km altitude. Another eruptive pulse occurred at 0830. Pilots reported plumes at 0910 and 1037 to 6 and 5 km altitudes respectively. At 1430, Redoubt's plume was about 150 km long and its satellite-derived temperature of -22°C suggested an elevation of about 6.5 km. Another moderate eruptive pulse was seen on satellite images beginning at 1530; 30 minutes later, the plume extended 40 km to the E.
AVO geologists flew over the volcano between 1240 and 1300 on 18 December. Vigorous white to gray steam clouds, some with ash and/or rock debris, rose to 6 km before moving NE. Tephra separated from the column at low altitude and was carried SE by light winds. Eruption columns emerged from a single large vent in the summit crater at roughly 2,400-2,550 m elevation; no other active vents were evident. A curtain of steam rose from the glacier-filled valley extending N from the crater, down to ~1,350 m, and individual steam plumes were evident down the valley to 750 m elevation. The source of the steam was apparently hot water from the vent area. Flooding in the Drift River appeared to be confined to its channel. Satellite data 19 December at 0635 showed the start of another moderately large eruptive pulse. By 0700, it extended 65 km with a maximum width of 23 km. A plume temperature of -32°C indicated a height of <=5.5 km. Another eruptive episode at 0750 had a smaller seismic trace but a pilot reported a rising ash cloud at 9 km altitude. Imagery at 1230 showed no evidence of large new eruptions, but thick low-level plumes were moving WNW, W, and WSW to 70 km from the volcano. Cloud top temperatures of -22° to -25°C suggested altitudes of 4-5 km. More diffuse plumes extended to 200 km. During an AVO overflight between 1240 and 1330, geologists observed billowing ash at the base of a sustained steam column that rose to <5 km. The strongest plume observed by the geologists reached 5.1 km altitude at 1245. A thin, ash-free yellowish fume layer at 5 km had an SO2 odor. Seismic records during the overflight indicated continuous low-level venting. Satellite data showed additional minor eruptions at 1400 and 1630, both with cloud top temperatures of -25°C, equivalent to about 4-5 km altitude. Emission of steam but no ash was reported 20 December. Pilots in the area reported strong sulfur smells but no ash layers. Distant cloud observations. By 16 December, pilots were reporting ash over the NW conterminous United States. Ash clouds were reported from as far as El Paso, Texas, 5000 km from the volcano, by 19 December. Data from the TOMS instrument on the Nimbus-7 satellite showed strong SO2 signals over W Nevada and nearby areas of S California at about noon on 16 December (figure 2). Only very minor possible SO2 enhancements off the coast of Baja California were evident during the satellite's next pass 24 hours later. Detection of SO2 near the volcano was not possible because of low seasonal sun angles. Data from earlier in the eruption were not immediately available. Figure 2. Preliminary data from the TOMS instrument on the Nimbus-7 polar orbiting satellite, on 16 December at about local noon. Each character represents the average SO2 value within an area about 60 km across. 0 = 12-16 milliatmosphere-cm (120-160 ppm-meters), 1 = 17-21 matm-cm (170-210 ppm-m), etc., increasing by increments of 5 matm-cm. 9 is followed by A, B, C, etc. Courtesy of Scott Doiron. Hazard mitigation efforts. In an effort to prevent aircraft encounters with volcanic clouds, NOAA and the FAA had recently concluded a formal agreement providing for detailed 24-hour monitoring of plumes by satellite specialists at SAB and forecasts of likely plume movement by NOAA's Air Resources Laboratory in support of the FAA's air safety and traffic flow responsibilities. The procedures outlined in the agreement, operating for the first time during the Redoubt eruption, yielded numerous detailed plume descriptions that prompted the issuance of frequent specific NOTAMs by the FAA. However, no air routes were formally closed. Since the onset of activity, AVO has immediately forwarded eruption data to the FAA, the Drift River oil facility, and other organizations with hazard responsibilities. The Drift River oil facility, with a capacity of about a million barrels, serves oil platforms in the Cook Inlet. As the eruption began, 7 of its staff of 11 were evacuated, but operations, including loading of tankers, were not halted until 20 December. A shutdown of more than a few days would force production cutoffs of at least some of the Cook Inlet platforms. The facility had not been built at the time of the 1966-68 eruption, and the effects of that eruption on the facility site are not known to us. Airline operations in Alaska were substantially reduced after the 15 December KLM incident, although some flights continued to and from Anchorage. With diminished activity 20 December, many airlines resumed at least partial service, and many of the passengers stranded by the activity were able to reach their destinations. Few people live near the volcano, but one family was evacuated from a lodge about 15 km S of the volcano. Despite occasional tephra falls, a family living at another lodge about 27 km N of the volcano elected to remain. Information Contacts: AVO Staff; C. Newhall, USGS, Reston; S. Kusselson, G. Swanson, O. Karst, and M. Ruminsky, NOAA/NESDIS; S. Doiron, NASA GSFC; N. Krull, FAA; E. Miller, Air Line Pilots Association; AP; UPI; Reuters. A series of explosions 14-19 December was followed by extrusion of lava into the active crater in late December. The lava dome was destroyed by strong explosions 2 January that triggered a major mudflow into the Drift River. Mud flowed against but did not penetrate the inner dikes protecting tanks at the Drift River oil facility. Vigorous explosions occurred again on 8 and 16 January, causing widespread light ashfalls, but associated mudflows were smaller. Lava extrusion had resumed on 18 January and seismic evidence suggested that it was continuing on 21 January. Aerosols from the explosive activity have not yet been widely reported, but lidar instruments in Germany detected new material near the tropopause and aerosol layers were evident at sunrise over Colorado (see Atmospheric Effects in 14:12). Petrography of 15 December tephra. Thin sections of a pumiceous juvenile lapillus and a lithic fragment, erupted 15 December, were examined at Michigan Technological Univ 60% of the pumiceous sample was vesicular colorless glass with refractive index <1.54. Plagioclase was the most abundant crystalline phase, in a variety of forms and sizes from <1 mm to microlites. Some were more sodic (An35-40) and unzoned, others were strongly zoned with An70 cores. Ferromagnesian phenocrysts (in order of decreasing abundance) included orthopyroxene, clinopyroxene, and amphibole, as well as titanomagnetite with rare sulfide inclusions. Tiny clots of more mafic material that was more completely crystallized were recognizable. The sample appeared similar to Redoubt tephra described by Riehle (1985) and was probably equivalent to an acid andesite or dacite. The abundant lithic material in the ashfall was a much denser oxyhornblende andesite with a hydrothermally altered groundmass. Avalanche and lahar deposits emplaced 14-19 December. Reconnaissance fieldwork on the N flank 26 December revealed thick deposits from a slush avalanche that appeared to have been triggered by pyroclastic flows, perhaps on 15 December. Scouring had occurred across the entire glacier where it was confined by valley walls, but only on the E half of its unconfined 3-km-wide lower portion. Water that apparently originated near the cloud-covered summit was flowing into the Drift River from a narrow channel eroded in the glacier. The avalanche deposit was roughly 10 m thick at a sampling site about 1 km beyond the nose of the glacier, which extends roughly 8 km from the vent. The deposit was very massive, with no grading or vertical sorting evident, although contacts could be seen between individual flow units (3 of which were evident from the helicopter). Breadcrust blocks that reached a maximum of about 1/2 m in diameter (in a very limited sample) were supported by a matrix of sand-sized ash, snow grains, and liquid water. After emplacement, water had drained from the upper portion of the deposit, leaving noticeable air space between ice grains, and saturated the snowpack below the avalanche, which refroze into a zone of horizontally banded ice. A sample from near the base of the avalanche had a bulk density of 1.09 g/cm3, with proportions by volume of 20% rock, 72% ice, and 8% pore space. Bulk densities of 2 samples from the porous upper portion of the deposit were only 0.85 and 0.72 g/cm3; one of the samples had volume proportions of 9% rock, 71% ice, and 20% pore space. Densities of the pyroclastic rock clasts ranged from 1.1 to 1.4. The avalanche had apparently been slushy during emplacement. Measurements of runup onto an older avalanche fan at a site 3.7 km below the nose of the glacier suggested a velocity of roughly 17 m/s. Subsequent floodwaters eroded the distal portion of the slush avalanche and carried numerous large ice blocks as far as the mouth of the Drift River, forming levees that helped to confine later flows. Some of the stranded ice blocks, which reached many meters in diameter, were clear glacial ice, others were eroded pieces of the slush avalanche. The flood rafted ice blocks to 8 m above the riverbed and 1.3 m up the 4-m L-shaped outer levee at the Drift River oil facility. Airphotos taken 16 December showed small lahars with lobate snouts that extended several kilometers down the SW side of the volcano. Most of the lahar deposition occurred below a 1/2-km-wide zone of roughly parallel erosional grooves that extended down the upper flank glaciers from the low point of the crater's S rim. However, patchy deposition occurred up to the crater rim, and the grooves were streaked with dark mud. Summit lava dome. About 21 December, a change in the character of local earthquakes and a slight increase in the number of small shocks suggested to geologists that magma might be approaching the surface. Poor weather continued to obscure the vent area, although a vapor plume that reached 7.5 km altitude and sulfur odor at about 3.5 km altitude were detected from aircraft on 22 December. Seismic activity declined slightly on 24 December, but numerous small earthquakes continued to occur near the summit. An overflight 26 December revealed a large elongate lava dome that emerged from a vent at the N edge of the 1.5-km-wide U-shaped breached crater, filled much of its N portion, and extended partway down the N flank. Many hot rock avalanches cascaded down the dome's steep N side, generating small billowing ash clouds that rose 300-600 m above the dome. The volcano continued to produce a vigorous vapor plume, primarily from the S side of the dome. Summit glow was visible at night roughly 80 km E of the volcano (on a low-light video camera at Kasilof). A slight increase in small earthquakes and rock avalanches near the summit during the next few days suggested an increased rate of lava extrusion. Ground and aerial surveys on 29 December confirmed significant additional growth of the dome, which was estimated from the air at roughly several hundred meters wide and twice as long. A vigorous gas plume that contained little ash rose 3.5-4.5 km. The dome had grown further by 1 January, and AVO estimated its volume at roughly 20-25 x 106 m3. Strong explosions and mudflow, 2-3 January. Shallow microearthquakes associated with the lava dome and deeper events centered 7-10 km below the volcano began a rapid increase after a magnitude 1.9 earthquake, the largest of the eruption thus far, at 1934 on 1 January. By the next afternoon, seismic energy release had built to about the same level as immediately before the start of the eruption on 14 December. At 1600 on 2 January, AVO issued a statement noting the potential for partial collapse of the dome's unstable N flank, deposition of hot tephra onto the glacier with resulting flooding in the Drift River valley, and moderate to strong explosive activity. The Drift River facility was promptly evacuated. Less than 2 hours later, a vigorous explosion at 1748 had the strongest seismic signal of the December-January eruption. Airplane pilots reported that the tephra column reached 13.5 km altitude; they saw apparent lava fountaining in the summit area, and noted incandescent material moving down the N flank into the upper Drift River valley. Residents of the Kenai Peninsula, across Cook Inlet from Redoubt, reported spectacular lightning. Ash moved NE in light wind, and minor ashfalls occurred at Anchorage. Satellite images (figure 3) showed a plume extending NE about 20-30 km at 1800, growing steadily to 430 km long and 620 km wide 6 1/2 hours later. Cloud top temperatures as cold as -53°C were measured from satellite data, yielding altitude estimates of roughly 8-8.5 km. The FAA issued warnings to aircraft, and most airlines cancelled flights to and from Anchorage. Another large explosive episode was recorded at 1927, and tephra was reported to 12 km altitude. Smaller explosive episodes were recorded at about 0130 and 0245 on 3 January. Figure 3. Thermal infrared image from a NOAA polar orbiting satellite on 2 January at 1915, about 1 1/2 hours after the onset of the explosive episode. Cloud top temperature suggests the plume is at about 8.5 km altitude. Courtesy of Michael Matson. During an AVO overflight between 1230 and 1300 on 3 January, a turbulent steam plume with only minor ash rose through weather clouds to 4-4.5 km. Clouds obscured the summit area on 3 January, but overflights during better weather 2 days later showed that the dome had been removed along with a substantial part of the upper Drift Glacier. Seismic activity had declined to the lowest level since the eruption began and there was no seismic indication of renewed lava extrusion. 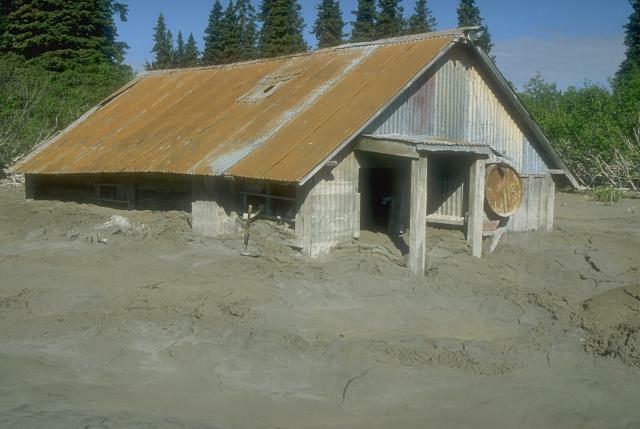 Pyroclastic flows during the 2 January activity generated a major mudflow that covered the entire active flood plain of the Drift River to the head of its delta, inundated the delta, and reached Cook Inlet, 32 km from the vent. An area of about 60 km2 was affected. Peak discharge at a site about 18 km from the vent was estimated to be roughly equal to that of Ruiz volcano's November 1985 Río Azufrado lahar. The pyroclastic flows incorporated large amounts of ice and snow, and were transforming into lahars by the time they reached 700 m altitude, near the nose of the glacier. The flow transported high-density, high-temperature dome rocks to the coast and carried ice blocks several meters in diameter that did not rise to the flow surface, indicating that it remained a fully developed debris flow. Boulders, more visible from the air at the lower end of the deposit, reached 4 m in diameter; many were still hot and generating small steam plumes on 3 January. Water pushed aside by the debris flow inundated the area N of the main Drift River delta, forming a large lake. Ice jams formed at the mouths of small streams in that area, temporarily damming them. Heavy deposition in its main channel diverted the Drift River into a stream with considerably less capacity (Rust Slough) S of the oil facility, protected on that side by neither dikes nor topography. Water and debris were then able to flow around the 4-m outer dike, crossed the facility's landing strip, damaged support structures, and shut off electricity, but did not overflow the 2.5-m inner dikes protecting individual oil tanks. The tanks were not damaged and no oil was spilled. Crews returned during daylight on 3 January to begin cleanup. The flooding at the Drift River facility forced the shutdown of 10 of the 12 Cook Inlet oil production platforms. Explosions and debris flows, 8-16 January. Strong explosive activity resumed 8 January with vigorous episodes at 1012 and 1048 (figure 4). No seismic precursor was noted, although the nearest seismic station, on the N flank, had been damaged in the 2 January eruption. Within 30 minutes, plumes reached 12-13.5 km altitude. The FAA issued an advisory to aircraft, and some flights were cancelled. Ash fell on the flanks and on a broad sector to the E, beginning about noon at Kenai (80 km E of Redoubt). Only a dusting of ash fell on Kenai, but Kasilof, about 25 km to the S, received more than 0.5 cm and was in "total darkness" at 1230. More than 1 cm accumulated at Soldotna, between Kenai and Kasilof. By 1430, satellite images showed that the plume, about 100 km long and 125 km wide, had detached from the volcano and extended nearly to Anchorage. Overflights later that day revealed no major changes to the summit area. A plume that was mainly vapor rose to about 5 km altitude [see also research aircraft data in 15:1]. Figure 4. Thermal infrared image from the NOAA 10 polar orbiting satellite on 8 January at 1026, about 15 minutes after the explosion began. The eruption cloud is rising to about 12-13.5 km altitude. Courtesy of Michael Matson. The 8 January pyroclastic flows triggered a debris flow much smaller than that of 2 January, but with a peak discharge comparable to that of the 18 May 1980 mudflow from Mt. St. Helens in the N fork of the Toutle River. One or perhaps 2 pyroclastic flows continued in a relatively dry state to below 500 m altitude on the glacier. Debris flow material was initially concentrated in a deep gully on the E side of Drift Glacier, then spilled NE across the floor of the Drift River valley (figure 5 (3) from 15:01). The flow bifurcated around a small hill on the valley floor; the S lobe stopped abruptly, but the larger N lobe continued downvalley, transforming into a hyperconcentrated flow within 15 km of the vent. It spilled through a breach in the moraine that enters the valley from the Drift River lobe of Double Glacier, and continued for another 5.5 km. Ultimately the flow became sediment-laden before stopping above the head of the Drift River fan. There was no noticeable impact on the channels downstream. After the 8 January activity, the main debris flow channel was stripped of ice down to about 1250 m altitude, and ice was only intermittently evident for the next couple of hundred meters. Figure 5. Generalized map of Redoubt, showing the 1989-90 vent area and locations of seismic stations monitored by the Alaska Volcano Observatory. Reprinted from Alaska Volcano Observatory Staff, 1990. A small explosive episode lasting roughly 15 minutes was recorded seismically on 11 January at 1001. No clear seismic precursor was detected, and poor weather prevented observations of the plume. Another brief eruption was reported at 1342, and a pilot estimated that the steam and ash cloud reached 12-13.5 km altitude. Multi-layered weather clouds made plume identification difficult on satellite images. A 20-minute explosive episode that began at 2248 on 16 January produced widespread ashfalls. Pilots reported ash to 9 km altitude and satellite data indicated that the plume reached 11.5 km. By 0015, ash was falling in Skwentna, 170 km NE of Redoubt, where more than 1/2 cm accumulated. Ash mixed with snow fell in Cantwell, 370 km NE of Redoubt, and began at Eilson Air Force Base (near Fairbanks, 550 km from the volcano) at 1111. Ash then continued E toward Canada. Data from debris flow detection devices indicated that a water and debris flow occurred in the upper Drift River within about 20 minutes of the eruption's start. One device, placed on the 8 January debris flow deposit, was triggered but not destroyed, suggesting that the 16 January flow was smaller. Considerable snow had accumulated on the Drift River flood plain since 8 January, and the flow continued to accumulate water as it continued downstream. Although the flow volume was not large in comparison with earlier episodes, it was sufficient to cause some of the water in the Drift River to return to its old channel. Personnel at the Drift River oil facility reported that no flooding occurred there. Renewed lava extrusion, 18 January. Aerial observations on 18 January between 1330 and 1500 revealed that a small lava dome was again growing in the vent [see also 15:1]. A vigorous steam plume rose to about 5 km altitude. Seismicity the next day suggested that lava continued to be added to the new dome. Small seismic events on 19 January at 0522 and 0655, each lasting 15-20 minutes suggested vigorous venting that may have included some ash emission, but the activity was not witnessed. Drift River oil facility. Concern about the potential for a major oil spill prompted the removal of most of the more than 900,000 barrels of oil that were stored in the Drift River facility's 7 tanks at the start of the eruption. Oil is transported by pipeline to the Drift River facility from 2 small coastal storage facilities (not accessible to tankers) that serve production platforms in Cook Inlet. Drainage of the Drift River tanks began about 10 January, and was expected to be completed about 20 January with the removal of a third tankerload of oil. To avoid prolonged shutdown of Cook Inlet oil production, officials tentatively planned to leave the Drift River facility empty until a tanker is ready to load, quickly fill the Drift River tanks from the small coastal holding facilities, then immediately pump the oil into the waiting tanker. Reference. Riehle, J.R., 1985, A reconnaissance of the major Holocene tephra deposits in the Upper Cook Inlet region, Alaska: JVGR, v. 26, p. 37-74. Information Contacts: AVO Staff; R. Janda and T. Pierson, USGS CVO; SAB; M. Matson, NOAA/NESDIS; W.I. Rose and J. Vallance, Michigan Technological Univ; C. Newhall, USGS, Reston; N. Krull, FAA; AP; UPI; Reuters. AVO's detailed summary of the eruption through late January appears in the 13 February issue of EOS, accompanied by a second paper on satellite observation of the December plumes (see References, below). Airfall tephra. Initial tephra studies suggest that airfall deposits have been relatively modest. At 8-11 km from the crater, most sectors showed 4-6 or more tephra layers in the snowpack, from <1 to 20 cm thick. One of the 15 December explosions generated pumiceous tephra, including fist-sized bombs that melted their way into the snow. Other explosive episodes appeared to have been dominated by accretionary lapilli and fine lithic ash. 8 January plume data. A monitoring aircraft operated by the Univ of Washington reached the 8 January plume about 2 1/2 hours after the onset of activity. Dimensions of the plume were measured with upward-looking lidar over the Kenai Peninsula (60.96°N, 151.17°W to 60.81°N, 150.02°W) between 1246 and 1257. The base of the plume was at about 3.85 km altitude and its top at 9.0-9.7 km, with the main mass of material at approximately 6.4 km. Mass median diameter of particles was about 7 µm. Inter-eruptive emissions monitored from the same aircraft before 8 January were SO2-rich, perhaps totaling several thousand metric tons/day, but attempts to collect COSPEC data failed because of low sun angles. Lava extrusion and minor venting, mid January-mid February. A new lava dome was first seen during an overflight on 18 January, although seismic evidence suggested the onset of extrusion by 13 January, before the 16 January explosion. Vigorous vapor emission limited observations of the dome in late January, and growth was difficult to discern. Rockfalls off the dome were extensive, but no new lobes or fissures were evident. It appeared to be slightly less than 100 m high and roughly 1/4-1/3 the size of the late December dome, which had an estimated volume of 25 x 106 m3. Additional breakage of the glacier that remained above the vent was indicated by new crevasses and ice avalanches into the crater. Ice blocks descended in stairstep fashion toward the dome from a vertical icewall. Most of the vapor emission originated from the area between the ice and the dome, obscuring the near-dome region and the interaction between ice and lava. A stream of meltwater flowed from the crater. A minor seismic event began at 2315 on 7 February and lasted for about 20 minutes, suggesting vigorous steam venting. It was detected only by the summit station, indicating that little if any ash was ejected. The dome appeared nearly unchanged during an overflight the next day. Shallow earthquake activity recorded near the summit increased 12 February, suggesting a higher rate of dome growth. A tremor-like episode on the seismic station nearest the summit began at 0305 on 13 February and lasted nearly 30 minutes. The seismicity was probably associated with vigorous gas venting, perhaps including a little ash. Shallow summit-area seismicity declined somewhat that day, but remained elevated, as dome growth apparently continued. Explosive episode, 15 February. A moderately large explosive episode that began at 0403 on 15 February produced a steam and ash column that rose to more than 10 km altitude and was carried rapidly SE by 160 km/hour winds. A spectacular display of lightning and thunder that lasted for about an hour awakened many people on the Kenai Peninsula. Satellite data 7 minutes after the onset of explosive activity showed a possible low-level pyroclastic flow or surge extending 7-10 km from the crater on Redoubt's NW quadrant. The temperature of the warmest 1 x 1 km pixel in this area was +25°C, with ambient air reported below -10°. By 0500, satellite images showed a plume extending about 120 km SE with an average width of more than 70 km. Plume temperatures of -49°C yielded an estimated altitude of 10.5-11.5 km for the top of the dense portion of the cloud. Airline pilots reported ash to 12 km altitude in the Homer area (roughly 120 km SE of Redoubt) and more than 1 cm of ash on Homer's airport runway. Anchorage's international airport remained open, but the FAA warned aircraft to avoid the area near the volcano. Most personnel were evacuated from the Drift River oil facility, but the 4 remaining crew members reported an increased flow of silty water in both the Drift River and Rust Slough, a small-capacity stream W of the oil facility into which much of the Drift River's flow was diverted by earlier mudflow-induced channel changes. The seismic station nearest the summit was destroyed, presumably by lightning, but seismicity decreased to low levels on flank stations 18 minutes after the onset of the eruption. An overflight the next day revealed that at least 75% of the lava dome had been destroyed. Pyroclastic flows had swept across the glacier's Piedmont lobe, and had entered small, previously unaffected drainages. A pyroclastic surge had moved about 2500 m up the N wall of the steep canyon that leads from Redoubt's breached crater. Flood deposits, slightly less extensive than those of 2 January, were primarily dark brown sediment, locally containing abundant 1-2 m boulders. Water had flowed around an L-shaped levee on the upriver side of the oil facility, and a small amount of water had penetrated the containment dike protecting the southernmost of the facility's 7 storage tanks, but no oil was spilled. Aerial observations on 18 February showed that a small new dome, with a volume of less than 1 x 106 m3, had begun to grow in the vent area. [See also 15:2]. Explosive episode, 21 February. Another vigorous explosion occurred on 21 February, beginning at  and lasting for about  minutes. Winds carried the plume rapidly NE, and by 0300 satellite images showed its front 700 km from the volcano, where it was about 80 km wide. Pilots reported that the base of the cloud was at about 7.5-9 km altitude E of Anchorage, and NOAA estimated that its top was at about 9-11.5 km. Light ashfalls were reported at Kenai (80 km E of Redoubt), Nikishka (80 km NE), Hope (175 km ENE), and Girdwood (200 km ENE). [See also 15:2]. References. Alaska Volcano Observatory Staff, 1990, The 1989-1990 Eruption of Redoubt volcano: EOS, v. 71, no. 7, p. 265, 272-275. Kienle, J., Dean, K.G., Garbeil, H., and Rose, W.I., 1990, Satellite surveillance of volcanic ash plumes, application to aircraft safety: EOS, v. 71, no. 7, p. 266. Information Contacts: AVO Staff; SAB; W. Scott, CVO; R. Ferek, Univ of Washington; UPI; AP. Strong explosions separated by periods of lava dome growth continued into March (table 1). Frequent seismicity, centered on Redoubt from the surface to about 10 km depth, has continued since mid-December (figure 6). Information about the 15 and 21 February explosive episodes supplements the initial reports in 15:01. Table 1. Strong explosive episodes and periods of lava extrusion during Redoubt's 1989-90 eruption, modified extensively from the original table with data from Brantley (1990). See Alaska Volcano Observatory, 1990, for a more detailed tabular summary of activity through January. 14 Dec 1989 1013 47 First major explosion; plume to 10+ km; debris flows and floods. 15 Dec 1989 1015 45 Plume to 12+ km; KLM jet loses power but lands safely; major lahar. 02 Jan 1990 1748 40 Plumes to 12 km; major lahars. 08 Jan 1990 1009 30 Plume to 12+ km; debris flow smaller than on 2 January. 15 Jan-15 Feb 1990 -- -- Extrusion of small dome, perhaps 1/4-1/3 the size of the late December-early January dome. 15 Feb 1990 0403 18 Plume to 10+ km; pyroclastic surge and flood. 15 Feb-20 Feb 1990 -- -- Lava extrusion and small pyroclastic flows. 21 Feb 1990 0032 12 Heavy ashfalls to NE but little flooding. 24 Feb 1990 0505 15-20 Plume to 9 km; substantial flooding. 24 Feb-28 Feb 1990 -- -- Lava extrusion. 28 Feb 1990 0846 10 Moderate explosive activity; plume below 6-8 km altitude. 28 Feb 1990 0947 -- Plume to 11 km; ashfall to 450 km NE; pyroclastic flows but little flooding. 04 Mar 1990 2039 -- Plume to 12-12.5 km; increased water flow. 09 Mar 1990 0951 -- Ash-poor plume to 10.5 km; moderate flooding. 10 Mar-13 Mar 1990 -- -- Extrusion of small lava dome. 14 Mar 1990 0947 -- Ash-poor plume to 12 km; moderate flooding. Figure 6. Epicenter map top and depth vs. time plot bottom, of earthquakes recorded near Redoubt by AVO, 12 December 1989-11 March 1990. Squares on the epicenter map mark positions of seismic stations. Station RDN, a few kilometers N of the summit, is obscured by numerous earthquake symbols. Courtesy of John Power, AVO. Explosive episode, 15 February; deposits and morphologic changes. Fieldwork after the episode revealed changes in the vent area, and pyroclastic flow, surge, and lahar deposits. The explosion had removed about 75% of the dome, leaving only a steep remnant of its W portion. The concentrically fissured icewall S of the vent appeared unchanged and remained steep. Steam from vigorous fumaroles obscured the vent area and the north gorge, a steep gully that had been cut into the upper Drift Glacier. Heavy ashfall had occurred over a broad area of the NNW to W flanks within 5-6 km from the vent, and airfall tephra was also evident to 6-8 km S and 20 km E to ENE of the vent. On the NNW flank, snow avalanches or slush flows moved across snow-covered glaciers and into gullies W of those affected by earlier explosions. A sheet flood of slush flows traveled NE and E from the summit, entering the Drift River from a small valley (E of Drift Glacier) also unaffected by previous explosions. A pyroclastic surge had spread N across the Drift Glacier to the crest of a steep ridge 750-900 m above the glacier's toe. The deposit near the ridge crest, 1-8 mm thick, was dominated by sand-sized andesite fragments with occasional pebble-sized grains. In a creek valley NE of the ridge, the deposit was coarser (very angular, coarse sand-sized andesite grains) and thicker (4-8 mm). The deposit also included willow branches to 8 cm in diameter and 1.5 m long, slightly scorched and thrust as much as 1 m into the snow. The surge was diverted eastward by the ridge, depositing dark material against another ridge 4-5 km to the NE, in a zone from about 450 to 850 m altitude. The base of this zone was about 300 m above the valley floor. The surge destabilized snow on steep sides of S- and SW-facing valleys, triggering snow avalanches (some ash-rich) and slush flows. Drift Glacier was mantled by a deposit of poorly sorted, massive, pebbly, medium sand-sized, pyroclastic flow material. The deposit ranged from a few centimeters thick on slopes to considerably more on flat areas, and appeared to be concentrated on the E half of the glacier. Portions of the deposit that were more than 20 cm thick were loose, easily fluidized, and hot (230°C at 20 cm depth measured at one site 9 hours after the eruption). Flooding had wet the top 10-15 cm of the deposit in gullies. The glacier itself was much more deeply gullied than it had been after the 8 January explosion, with many large ice blocks partially detached from the glacier surface. The pyroclastic flow(s) and surge fed a mixed flood of water and pyroclastic debris that caused considerable erosion of the glacier and the banks of the Drift River (W of the glacier's Piedmont Lobe). Most of the debris was sand-sized, but included clasts (some juvenile) up to 1 m in diameter, plus clear ice from Drift Glacier and large amounts of snow from the glacier and valley. Hot andesitic dome rocks were found as much as 37 km from the dome (30 km from the glacier). The flow was apparently very water-rich for its entire length, which extended 33-35 km from the glacier to the oil facility at the mouth of the Drift River. Heights of overtopped banks suggested that the flow was 5 m or more deep in the gully on the E side of the glacier and was still 1-2 m deep in the lower valley. A zone of snow blocks 1-8 m wide marked flow margins. Flow characteristics were detailed from field evidence. The W portion of the flow moved as much as 15-20 m up a valley moraine, and energy calculations suggested a minimum velocity of 60-70 km/hour. About halfway down the valley, flow speed had apparently slowed to less than 30 km/hour, while evidence of splashing against the valley wall indicated considerable turbulence. Although the flow filled most portions of the valley from wall to wall, islands were left in wider sections, suggesting a maximum discharge less than that on 2 January. Below the canyon mouth, some of the peak flow followed the old Drift River channel, but most went into Rust Slough, a relatively low-capacity stream. Muddy water from Rust Slough entered the oil facility roughly 4 hours after the onset of the eruptive episode, flooding a larger area than on 2 January, but caused no major damage. Some water seeped through (but did not flow over) the southernmost tank's containment dike, and did no apparent damage. Small pyroclastic flows and dome growth, 15-20 February. A pyroclastic flow moved about halfway down the Drift Glacier's north gorge on 15 February between about 1450 and 1505. Gas jetting had been audible about 30 minutes earlier, and an abrupt 40% increase in stream discharge preceded the pyroclastic flow by about 15 minutes. An overflight on 18 February revealed that a small new lava dome was growing in the previously active vent. Geologists observed another pyroclastic flow, triggered by dome collapse, that moved down the gorge on 20 February at 1338. A dark ash plume rose from the flow to about 3.5-4.5 km altitude, depositing a small amount of ash to the ENE. A similar but larger episode was seen from the Drift River oil facility at about 0600, accompanied by a plume and lightning. Steaming pyroclastic flow deposits in the gorge extended to about 700 m altitude, and fresh ash ENE of the vent, primarily from the early morning episode, lay on snow that had fallen 16-17 February. Explosive episode, 21 February. An explosion that produced a large steam and ash plume accompanied by thunder and lightning began at 0032 and lasted for about 12 minutes. Ash deposits appeared thick NE of the volcano. Ashfall was reported at Kenai (80 km E), Hope (175 km ENE), and Girdwood (200 km ENE), and significant ashfall at the Drift River oil facility prevented evacuation of its crew. Both the Drift River and Rust Slough were bank-full before the activity began, but much less additional stream flow was generated by this explosive episode than on 15 February and only minor flooding resulted, without reported damage or injuries. The small dome that had been growing in the crater was partially destroyed by the explosion. Some pyroclastic flow deposits were visible on the glacier near the gorge. Explosive episode, 24 February. Seismic stations near Redoubt began to record a strong signal associated with explosive activity at 0505. Amplitude increased sharply after 45 seconds, saturating instruments 8 km S and 11 km NW of the volcano for 3 1/2 minutes, then gradually decreased for 10-12 minutes. Seismicity had returned to background after 15-20 minutes. A steam and ash column rose to about 9 km altitude, accompanied by thunder and lightning. Heavy weather clouds prevented observations by satellites, but ashfall was reported along a narrow zone extending NE from the volcano. At the Beluga power plant (130 km NE of Redoubt), the main power source for Anchorage, light ashfall began at about 0630 and heavy ashfall 30 minutes later. All but one of its gas turbines were shut down to prevent damage. Ashfall stopped at Beluga by 0935, and was reported farther NE of Redoubt at Alexander (150 km from Redoubt, before 0935), Willow (200 km NE, 0800-0945), Kashwitna (210 km NE, 0930), and Montana (230 km NE, well before midafternoon). Water in Rust Slough, W of the Drift River oil facility, abruptly rose 2/3-1 m at 0915, then stabilized and began to recede after about 15 minutes. A second crest, at 1015, flooded the S half of the oil facility's runway. Helicopter observations suggested that about 30% of the Drift River/Rust Slough channel was occupied during peak flow. Aerial observations revealed that another small lava dome had begun to grow in the active vent after the 24 February explosion. Explosive episode, 28 February. Seismic data indicated that explosive activity began at 0846, continued at a relatively low level for about 10 minutes, paused, then resumed more vigorously at 0947. During the initial pulse, no ash rose above the tops of weather clouds at 6-8 km altitude. Ash was reported at 11 km altitude within 9 minutes of the onset of the much stronger second pulse. Satellite data showed a cloud about 25 km across extending ENE from Redoubt at 1000, as ashfall was beginning on oil platforms in the Cook Inlet. Light ashfall had begun in the Anchorage area, roughly 170 km ENE of Redoubt, by 1130, and was reported at Talkeetna (about 250 km NE), Fort Richardson (NE of Anchorage), the Prince William Sound area (roughly 300 km E), and the Copper River basin (roughly 450 km NE). By 1400, infrared imagery showed a cloud about 120 km long and 100 km wide moving rapidly ENE, nearly 600 km from the volcano. A seismometer near the Drift River recorded 2 apparent flow events, the first associated with the initial pulse, the second, much larger, with the stronger second pulse. Significant flooding was anticipated for the lower Drift River, but instead, its flow declined somewhat. During field work several days later, deposits from numerous pyroclastic flows were found on the Drift Glacier, some of which may have temporarily blocked the main N flank drainage channel on the glacier. Such blockage, if any, had ended by 4 March. Explosive episode, 4 March. A large explosive eruption occurred at 2039. An airplane pilot reported that the eruption cloud had reached about 12 km altitude 30 minutes after the onset of the activity. The cloud moved N, and ashfall was reported about 30 km NNE of the volcano. By 2330, infrared imagery from the GOES satellite showed a cloud about 55 km (W-E) x 50 km (N-S) 325 km N of the volcano. Comparison of the satellite-derived cloud temperature with radiosonde temperature profiles from Anchorage 8 1/2 hours earlier suggested an altitude of about 12.5 km for the top of the dense portion of the cloud. Increased water flow, but no flooding, was reported from the Drift River oil facility. [See also 15:3]. Explosive episode, 9 March. An explosion at 0951 ejected an ash-poor plume that reached about 10.5 km altitude, accompanied by lightning. The explosion was slightly larger than those of 21, 24, and 28 February, and 4 March, but significantly smaller than the 15 December, 2 January, and 15 February episodes. At 1108, a satellite image showed a plume about 90 km across (E-W), extending N and W from the volcano (figure 7). Ash fell to the W and NW, as much as 55 km from the volcano (in the Lake Clark Pass area). Flooding occurred in the Drift River, and water flowed into small streams just to the S (Rust Slough and Cannery Creek), but no water penetrated dikes protecting the Drift River oil facility. The activity was preceded by a magnitude 5.5 earthquake centered 82 km below Redoubt. Shallow seismicity remained elevated for 3-4 hours after the explosion, then declined, but remained above background level. By the next day, a small dome was again being extruded from the summit vent, and seismic data indicated continued dome growth through 13 March. [See also 15:3]. Figure 7. Image from the NOAA 10 polar orbiting satellite on 9 March at 1108, showing a bright white plume extending W and N from Redoubt. The plume's longest (E-W) dimension is about 90 km. Courtesy of G. Stephens. Explosive episode, 14 March. Explosive activity began at 0947, ejecting a plume to 12 km altitude that was also accompanied by lightning. There was little or no ash in the upper portion of the plume. Seismic data suggested that the explosion was slightly more vigorous than on 9 March, but the plumes appeared similar. Most of the ashfall occurred E and NE of the volcano on the W side of Cook Inlet. Traces of ash were reported on the Kenai Peninsula and in the Anchorage area. Satellite data at 1030 showed a plume moving ENE. The satellite-derived temperature of the dense portion of the plume was -40°C, corresponding to an altitude of about 7 km. Moderate flooding occurred in the lower Drift River, and some water was again diverted into Rust Slough and Cannery Creek. Water did not enter the oil facility, where 90,000 gallons of oil had leaked through a defective or open valve on 10 March. The oil had been confined by a containment dike, and most had been cleaned up by the time of the 14 March activity. [See also 15:3]. Information Contacts: AVO Staff; SAB; UPI; AP; Reuters. Quoted material is from the AVO staff. Information about the 4, 9, and 14 March explosive episodes supplements the initial reports in 15:02. "Lava dome growth disrupted by moderate explosions and gravitational collapse continued. Since 15 February, explosive episodes have occurred at average intervals of 3-9 days (table 1). Explosive episodes were associated with pyroclastic flows and surges that triggered floods and lahars in the Drift River valley, which drains the volcano's N flank (figure 8). Seismicity remained centered on Redoubt from the surface to a depth of about 10 km, but earthquakes of M >= 2.0 have not occurred since 9 March. The summit seismometer that was damaged during the 15 February event was removed in March and three new seismometers were placed on the volcano's summit and flanks. COSPEC measurements began on 20 March; data are collected as weather permits. SO2 emission rates have ranged from 1,600 to 6,000 t/d." Figure 8. Sketch map of the Drift River valley and related drainages on the NE flank of Redoubt. The Drift River oil facility is between the mouth of the Drift River and Rust Slough. Courtesy of AVO. Since early January, deposition in the Drift River's main channel has diverted significant amounts of flood water and debris into Rust Slough, S of the Drift River oil facility. An L-shaped 4-m-high levee upstream from the oil facility was designed to protect it from Drift River floods, but neither levees nor topography protect its S side. Beginning on 4 March, deposition in Rust Slough has diverted floodwater farther southward into Cannery Creek, just upstream of the Drift River facility. None of the subsequent floods associated with March-mid April explosive episodes have affected the oil facility. Explosive episode, 4 March. "An explosive event that occurred at 2039 was recorded for 8 minutes at the Spurr station (a regional seismometer about 100 km NNE of Redoubt that has been operating since the onset of the eruption). By 2110, an ash plume was reported to an altitude of 12 km; the plume moved N20°E and ashfall occurred 225 km away. Moderate flooding occurred in the Drift River. A new diversion upstream of the Drift River oil facility caused much of the flow to be diverted S of the facility (from Rust Slough into Cannery Creek). Explosive episode, 9 March. "An explosive event occurred at 0951 and was recorded for 10 minutes at the Spurr station. Tephra fell primarily W of the volcano; Port Alsworth, 95 km SW of the volcano, received a light dusting from the southern margin of the plume. Floodwater reached the Drift River oil facility about 2 3/4 hours after the onset of the event. Explosive episode, 14 March. "Explosive activity that began at 0947 was recorded for 14 minutes at the Spurr station. Tephra fell E of the volcano; the Drift River oil facility reported heavy ashfall from 1057 to 1247. Oil facility crews were evacuated because of the heavy ashfall. Traces of ash were reported on the Kenai Peninsula and in the Anchorage area." Satellite images (figure 9) showed the plume moving ENE. The temperature at the top of the dense portion of the plume was -40°C at 1030, corresponding to an altitude of about 7 km. Winds were relatively light, and by 1230, the plume extended less than 150 km N and about 100 km E of the volcano. Figure 9. Image from the NOAA 10 polar orbiting satellite, 14 March at 1054, about an hour after the onset of the eruptive episode. An elongate plume extends ENE of Redoubt. Courtesy of G. Stephens. "Moderate flooding occurred in the lower Drift River valley. Peak flow velocity was about 6 m/sec. The flood reached the oil facility about 2 1/4 hours after the onset of the explosive episode. The flood carried numerous ice blocks and hot angular dome rocks 16 km from the glacier, where peak discharge was estimated at 1200 m3/sec. "On 15 March, after a vigorous 2.5-minute seismic event was recorded at all seismic stations, an AVO field crew was warned about a possible explosion. They reported no changes in steam plume activity and did not hear any noises. However, 20 minutes later, they noted an approximate doubling of the Drift River's discharge 4 km downstream from the glacier. The increased discharge was accompanied by large quantities of cobble-sized ice. "A small dome in the summit area was observed by field crews on 16, 18, 20, and 21 March. The dome appeared to be growing slowly between observations. Explosive episode, 23 March. "Seismicity indicating the onset of explosive activity began at 0404 and was recorded for 8 minutes at the Spurr station. Seismic activity at the summit stations had increased around 0000 on 22 March and had stayed at elevated levels for most of the day. Seismic activity then decreased several hours before the 23 March explosive episode. A plume was reported to 10.5 km but appeared to be mostly steam. Light ashfall was observed W of the mountain, but ash did not fall on any community. Discharge increased in the Drift River." An image from the NOAA 11 polar orbiting satellite at 0430 (figure 10), 26 minutes after the onset of the explosive episode, showed a plume extending WNW from the volcano. The top of the dense portion of the plume had a temperature of -39°C, yielding an altitude estimate of slightly less than 9 km based on the radiosonde temperature/altitude profile over Anchorage 1.5 hours earlier. The plume continued to move rapidly WNW, and by 1430, 10.5 hours after the explosion, its center was about 850 km from the volcano. Figure 10. Image from the NOAA 11 polar orbiting satellite, 23 March at 0430, about 30 minutes after the start of the eruptive episode. The nearly circular plume is just WNW of Redoubt. Courtesy of G. Stephens. "Pyroclastic flow deposits covered the lower Canyon (below 825 m) and the upper piedmont area (above 500 m) of the Drift glacier. The deposits were generally hot, dry, and friable; where they rested on snow, the basal part of thick deposits, and those less than 50 cm thick, were wet and warm to the touch. Pyroclastic deposits were still hot (325°C) when measured on 26 March. "Views into the crater on 23 March were largely obscured by steam but much of the dome appeared missing from the summit area. Poor weather obscured observations of the summit area from 26 March until 6 April. Explosive episode, 29 March. "Seismic activity indicated that an explosive event began at 1033 and was recorded for 7 minutes at the Spurr station. An increase in discharge of the Drift River was reported, reaching the oil facility by 1307. Pilots reported a plume, consisting chiefly of steam, to 15 km. Tephra fallout appears to have been similar to that of 4 March; light ashfall was reported to 225 km N-NE of the volcano. "Poor weather prevented ground observations or views of the glacier. Deposits from a debris flow or hyperconcentrated flow were observed in the upper valley and flooding appeared similar to 23 March. No hot debris or ice blocks were observed in the upper valley. Explosive episode, 6 April. "Seismicity increased throughout the morning of 6 April. An explosive event began at 1723 and was recorded for 7-8 minutes at the Spurr station. Seismicity declined after the explosive event. An ash plume was reported to 9 km; wind shear caused the lower part of the plume to drift NW and the upper part to drift E. The ash plume reached the W coast of the Kenai Peninsula by 1808, but only light ashfall was reported in Kenai during the evening. "Pyroclastic flow deposits overlay the glacier down to about the 610 m level. A debris flow of dome-rock material and ice boulders flowed onto the Drift River valley, and peak flow velocity was estimated at 22 m/s. Peak discharge attenuated quickly downvalley. Dome growth and hydrologic events 7-13 April. "A dome was first observed in the summit area on 7 April. This dome appeared to be larger when observed on 10 and 13 April and was greatly oversteepened on the N face. 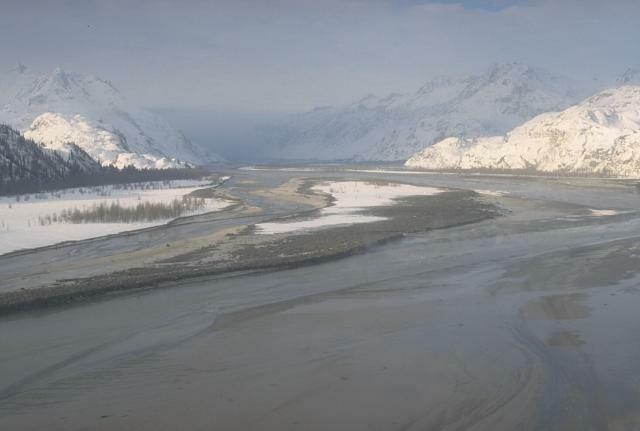 "On 7 April, discharge near the E canyon mouth of the Drift River glacier fluctuated by 30-50% several times during a 1/2-hour observation period. A flood of ice blocks up to 1 m across caused a 4-fold discharge increase in one of the large glacier canyons. Repeated increases in discharge were noted over a 15-minute observation period. An iceslide blocked the entire width of the canyon bottom upstream of the increased discharge area. Episodic release through a tunnel at the base of the ice jam may explain the surges observed at the canyon mouth. "On 10 April a rootless phreatic eruption was noted on the Drift Glacier at the 890 m level, causing a vigorous ash and steam plume to rise 1,000 m. A series of explosions migrated N and S of this area along a glacier bed stream, producing an elongate crater perhaps 300 m long. Numerous small pyroclastic flows emanated from the explosion area and formed a small pyroclastic flow fan that dammed the main water flow from the dome area for about an hour. Failure of the dam caused a flood with an estimated discharge of 10 m3/s. Explosive event, 15 April. "A moderate explosive event occurred at 1440 and lasted about 8 minutes at the Spurr station. The ash plume reached elevations between 9 and 12 km and the plume moved N-NW. There were no clearly identifiable seismic precursors. Seismic activity before and after the event appeared unchanged." [See also 15:04]. Information Contacts: AVO Staff; SAB. This report, from the AVO staff, covers the period 15 April-15 May, 1990. Information about the 15 April explosive episode supplements the initial material in 15:3. "Lava dome growth punctuated by small explosive events and partial dome collapse continued to occur. In general, seismic and explosive activity were at relatively low levels (figure 11). Intense steaming in the crater area coupled with poor weather have limited viewing of the dome and crater area to 5 observations during the report period. The pattern of explosive eruptions every 3-9 days that had characterized Redoubt's activity from 15 February to 21 April has changed; as of mid-May, the last significant explosive event had occurred on 21 April, 3.5 weeks earlier. Figure 11. Epicenter map (top) and depth vs. time plot (bottom) of earthquakes recorded near Redoubt by AVO, 15 April-15 May 1990. Squares on the epicenter map mark the positions of seismic stations. Near-summit stations are obscured by numerous seismic signals. Explosive episode, 15 April. "A moderate explosive event occurred at 1440 and was recorded for 8 minutes at the Spurr station. The explosive event triggered a pyroclastic flow down the N face of the volcano, and a mudflow that carried hot blocks of dense dome rock 1-2 m in diameter 4 km downvalley (to the E end of the Dumbbell Hills; figure 12). A small flood reached the Drift River oil facility about 3 hours after the onset of the episode (about 40% occupied the Drift River channel, the rest the Rust Slough and Cannery Creek channels). Winds carried the tephra N-NW from Redoubt; flat discs of pumice up to 4 cm in diameter were noted about 10 km NW of the vent area. Three cloud-to-ground lightning strikes were detected NW of the volcano. Figure 12. Sketch map of the Drift River valley and related drainages on the NE flank of Redoubt. The Drift River oil facility is between the mouth of the Drift River and Rust Slough. Courtesy of AVO. Explosive episode, 21 April. "A small to moderate explosive event occurred at 0611 and was recorded for 4 minutes at the Spurr station. An ash-laden plume was reported to 7.5-9 km and a disc-shaped 'collar' was observed at about half that altitude by personnel at the Drift River oil facility and residents of the Kenai Peninsula. Light ashfalls occurred N-NW of the volcano to about 75 km distance. Heavy steaming prevented good observations of the crater area, but it was apparent that at least some of the lava dome remained in the crater. The episode triggered a small pyroclastic flow and surge. No significant flooding was associated with this episode. Minor explosive events. "A small seismic event that occurred on 26 April at 1017 was recorded for 2 minutes at Spurr station. An AVO field crew reported an ash plume rising above the volcano and heading SE. Light ashfall reached 100 km SE of the mountain. The episode included a small pyroclastic flow that terminated at about 1,000 m on the N flank. The summit area was partially obscured by clouds, but it appeared that about 80% of the dome was intact and was still oversteepened to the N. An overhanging slab extended from the dome's NE rim; collapse of a similar slab may have triggered the pyroclastic flow. No flooding in the Drift River valley accompanied the event. "A seismic event on 7 May at 1846 was too small to be recorded at Spurr, but pilots reported a plume to 9.5 km, consisting mostly of steam with a little ash. No pyroclastic flows were reported to have been associated with the event, and no hot blocks were noted by an AVO crew in the field the next day; however, poor weather prevented observations above 750 m altitude. A dusting of ash (presumably from the 7 May event) was seen on the upper flanks on 10 May. Dome observations. "The dome was only observed five times during the report period, on 21, 25, 26, and 28 April, and 5 May. Thus, no views of the dome were obtained between the explosive episodes on 15 and 21 April, nor since the small explosive event on 7 May. The crater area was exceptionally clear on 25 and 28 April, and in both viewings the dome had a rough, blocky surface with transverse tension cracks exhibiting a smooth, massive interior. On 25 April, the dome was oval in plan, but by the 28th it was elongate N-S and oversteepened on its N side. Blocky talus that covered the canyon floor for a couple of hundred meters N of the dome on 28 April was not observed on the 25th. When the dome was last viewed on 5 May, it was partially obscured by steam and low clouds, but the surface was definitely smooth and massive, not rough and blocky." This report covers the period 15 May-15 June, 1990. "Seismic activity beneath Redoubt remained at low levels throughout the report period (figure 13). A small increase in both shallow and deep earthquakes occurred 13-18 May, staying at this slightly elevated level for about 1 week. Seismicity then returned to pre-13 May levels and has remained low, but still above pre-eruption levels of early December 1989. Figure 13. Epicenter map (top) and depth vs. time plot (bottom) of earthquakes recorded near Redoubt by AVO, 15 May-15 June, 1990. Squares on the epicenter map mark the positions of seismic stations. "The lava dome and crater area were obscured by low clouds 5-21 May. During this period, the lava dome grew substantially to what is estimated as the third largest to have formed since the eruption began in mid-December 1989. After 21 May, the dome was enshrouded by clouds until 1 June, when a new lobe was seen on the S side of the dome. AVO crews were able to observe the dome almost daily during the first week in June, but noted no new changes. The early June dome surface was variable in texture with both large smooth massive areas and blocky scoriaceous zones. Precipitates were ubiquitous near the dome's summit. The lava dome has not been observed since 7 June due to cloud cover and steaming in the crater area. "A small seismic event on 26 May at 1421 appears to have been related to material spalling off the dome. The event was accompanied by a plume that reportedly reached 6500 m, composed primarily of steam. Light ashfall was observed in the crater area and a minor flood event occurred in the upper Drift River valley. "Nine COSPEC flights yielded SO2 emission rates that ranged from 1200 to 4400 t/d. During the latter half of the report period, SO2 emission rates were below 3100 t/d. Late May and early June rates were lower than those of any similar period since COSPEC measurements began on 20 March." This report covers the period 15 June-13 July 1990. "Shallow seismic activity at Redoubt has remained at low levels during the report period (figure 14). However, 3 larger-than-normal earthquakes occurred beneath Redoubt during late June, ranging in depth from 5.8 to 7.5 km and in magnitude from ML 1.6 to 1.8. The events pushed the seismic energy release at these depths to the highest levels seen since early March. Figure 14. Epicenter map top and depth vs. time plot bottom of earthquakes recorded near Redoubt by AVO, 15 June-13 July, 1990. Squares on the epicenter map mark the positions of seismic stations. "The lava dome and crater area have been largely obscured by clouds and heavy steaming during much of the report period. However, the dome was seen on several clear days in late June and early July, and observers saw no significant change in either its size or surface. Three COSPEC flights during the report period yielded SO2 emission rates of <1,000 t/d. These are the lowest values since COSPEC measurements began in late March." This report covers the period 14 July-13 August 1990. "There were no explosive or seismic events at Redoubt during the report period. Seismic activity remained low. Earthquakes continued to occur at 4-10 km depth (figure 15), but were all below ML 1.5. Although seismic activity was low, it has not returned to pre-eruption levels. Figure 15. Epicenter map top and depth vs. time plot bottom of earthquakes recorded near Redoubt by AVO, 10 July-15 August, 1990. Squares on the epicenter map mark the positions of seismic stations. "Repeated observations of the lava dome indicated that its N face has been stable since late June. The S side of the dome has been largely obscured by clouds and steam since early June, but brief glimpses indicated that it too was largely unchanged. "Four COSPEC flights in the last month yielded SO2 emission rates between 1,000 and 2,000 t/d. These values were slightly higher than those of the preceding report period, but remained in the lower third of values detected since measurements began on 20 March. "Although seismicity has not yet returned to pre-eruption levels, other indications suggest that Redoubt is in a quiescent period. Therefore, no further communications regarding activity at Redoubt are forthcoming unless current conditions change." The following report covers the period 1 August-12 November. "The last explosive event at Redoubt, on 21 April, generated an ash plume to 7.5-9 km and a small N flank pyroclastic flow. A portion of the existing lava dome was destroyed during this event. Dome growth continued until approximately mid-June, punctuated only by occasional small rockfalls off the dome's N face. The estimated volume of the current lava dome is 10-15 x 106 m3. Field crews have observed consistent fumarolic activity from the dome's S side, summit, and E and W margins. An early September search for high-temperature fumaroles on the dome's accessible N face was unsuccessful. COSPEC measurements documented a steady decline in SO2 emission from an average of 1,000-2,400 t/d in early August to 160-590 t/d in October and early November. "Seismicity beneath Redoubt diminished over the summer and into the fall, but remained elevated relative to pre-eruption levels. In early November, low-level tremor was observed for the first time since April, associated with increased steaming on the lava dome and occasional minor steam and ash emissions. October steam and ash emissions. "Beginning in late August, AVO seismologists noted intermittent bursts of seismicity containing multiple phases and extended codas on flank stations. These bursts occurred at rates of one to several/day, but no relationship between them and eruptive activity was established until 29 October, when AVO received a pilot report of ash on the snow-covered flanks of Redoubt. The ash deposit was thin (< 0.5 mm) and did not extend beyond the base of the volcano (a lateral distance of about 5 km). The deposit must have been emplaced since 27 October, the date of last overflight prior to the pilot report. On 30 October at 1637, a small seismic event lasting 7-8 minutes was recorded on flank stations. Within 30 minutes, personnel at the Drift River oil terminal and an AVO crew in a helicopter reported a small, diffuse ash cloud drifting E of the summit. The cumulative tephra deposit from the late October events is very fine-grained, consisting primarily of plagioclase and a minor amount of altered and unaltered mafic crystals. "The steam and ash emissions have thus far produced plumes that rise at most 300-600 m above the summit, and only minor amounts of ash have been deposited outside the summit crater. They are reminiscent of the 'gas and ash emissions' documented at Mt. St. Helens between 1981 and 1986, and are interpreted to reflect increasing access of meltwater to hot interior dome rocks. Their onset in late summer approximately coincided with the beginning of snowfall high on the volcano and may reflect some seasonal control related to the increasing availability of snowmelt. Alternatively, the quiescent dome may have cooled and fractured sufficiently to allow ingress of greater amounts of water to its hot interior. Early November seismo-phreatic crisis. "On 5 November, AVO seismologists noted low-amplitude tremor on flank stations. During the next week, tremor fluctuated in intensity several times. More intense periods appeared to follow the 'emissions' described above. No concurrent change was observed in the occurrence of long-period events or volcano-tectonic earthquakes. "Observations of the dome from fixed wing aircraft 6-8 November revealed no sign of avalanching or large-scale changes in dome morphology. Fumarolic activity appeared heightened compared to the previous week and new steaming was observed on the dome's N flank. "An 8 November COSPEC flight measured SO2 emission of 580 t/d, consistent with results of the past few weeks. Continuing phreatic activity, in the form of steam emissions that occasionally contain ash, is expected." Further Reference. Brantley, S., ed., 1990, The eruption of Redoubt volcano, Alaska, December 14, 1989-August 31, 1990: USGS Circular 1061, 33 p.
The following report, from the AVO staff, covers the period 12 November-14 December. "No significant change in activity has been observed at Redoubt since the last report. Steam and ash emissions from the lava dome, detected seismically, continue at a rate of several/day. No reports of ash deposition on the flanks of the volcano have been received, suggesting that these phreatic events continue to be relatively minor. However, decreasing daylight hours and infrequent overflights have limited observations. "Overall seismicity at Redoubt is at a low level, and continues to decline slowly. The automatic event detection system triggered on 246 events between 12 November and 14 December (about 8 events/day). These are mostly shallow B-type (low-frequency) events in the vicinity of the lava dome, although a few A-type (high-frequency) events daily continue at 4-10 km depth beneath the volcano. Shallow tremor associated with steam and ash emissions continues to be recorded several times/day, with typical durations ranging from 5 to 20 minutes; occasionally, periods of nearly continuous tremor may last several hours. These longer periods appear, in some cases, to be 'triggered' by one of the steam and ash events. "AVO field crews observed the partly snow-covered lava dome on 14 December, and reported that it continued to steam vigorously, as did some of the pyroclastic flow deposits at the N base of the volcano. A minor amount of ash mantled the dome's surface. No significant ash deposits were seen elsewhere in the crater or on the volcano's flanks. "COSPEC measurements have not been made at Redoubt since 8 November. Insufficient ultraviolet light precludes operation of the COSPEC until sometime in February." Poor weather and limited daylight have prevented geologists from observing the summit area since 14 December, when vigorous steaming was occurring from the lava dome and a minor amount of ash mantled its surface. The following is from the Alaska Volcano Observatory. "Seismicity at Redoubt continues at roughly the same rate that has characterized the volcano since summer. Shallow, long-period events continue to occur beneath the summit crater, as do volcano-tectonic earthquakes 5-9 km beneath the summit (figure 16). The gas events that generate long (5-45 minutes) low-frequency signals (figure 17) have declined slightly and were occurring at roughly one event every several days in early January. A particularly vigorous event began at roughly 1700 on 4 January." Figure 16. Epicenter map top and depth vs. time plot bottom of earthquakes recorded near Redoubt by the Alaska Volcano Observatory, 1 December 1990-12 January 1991. Squares on the epicenter map mark the positions of seismic stations. Figure 17. Portion of a 4 January 1991 seismograph record showing a characteristic prolonged, low-frequency gas emission signal from Redoubt. A few brief high-frequency events are also present. Offsets are at 1-minute intervals. A series of strong explosions from Redoubt began on 14 December 1989 after several days of increased seismicity. Large tephra clouds were ejected, disrupting air traffic, and mudflows fed by water from the volcano's glaciers forced the closing of a major oil storage facility. Lava extrusion into the summit crater was first observed on 22 December, building a series of domes that were repeatedly disrupted by explosions. The explosive activity gradually became less vigorous, and dome growth stopped in the late spring. The following summarizes 10 January to 7 February 1991. "Seismicity at Redoubt continued at roughly the same rate that has characterized activity since mid-1990. The occurrence of long, low-frequency signals associated with 'steam and gas emissions' has decreased to an approximate rate of 1-2/week. Shallow, long-period events beneath the lava dome and volcano-tectonic earthquakes 5-9 km below the volcano continue to occur. A slight increase in shallow, high-frequency earthquakes, possibly associated with adjustment of the lava dome, was noticed about 29 January. "COSPEC measurements of SO2 emission rates at Redoubt were attempted on 23 January. Low ultraviolet levels in the winter sky combined with relatively low SO2 resulted in a high signal to noise ratio, but an average emission rate of about 300 t/d was calculated for two of the five orbits. This value is at the low end of the range of emission rates measured since March 1990. The last COSPEC result, approximately 570 t/d, had been obtained on 8 November. "The lava dome appeared unchanged since the last report period, and it was heavily mantled with snow. Fumarolic activity remains vigorous, especially on the S and W sides. A minor amount of ash was occasionally visible on the dome and crater walls." In late July 2008 field crews from the Alaska Volcano Observatory (AVO) working around the summit of the volcano smelled hydrogen sulfide (H2S) gas. Then, on 16 September 2008, a pilot flying downwind of Redoubt reported smelling a strong sulfur-dioxide (SO2) odor. A week later, residents of a cabin near Wadell Lake (25 km NE) reported loud noises coming from the direction of Redoubt. During an overflight on 27 September 2008, scientists observed several fractures and circular openings in the upper Drift glacier that had not been seen before. They also noted that fumaroles atop the 1968 and 1990 lava domes were more vigorous than when last observed in mid-August. A distinct H2S odor was also evident, though no SO2 was detected by onboard instrumentation. The seismic network at Redoubt did not detect any abnormal earthquake activity. Satellite thermal instrumentation detected warming near the summit craters on 13 October. Fumarolic activity and water flowing beneath Drift glacier on the N flank had produced a 45-m-wide melt or collapse hole at an elevation of about 1,700 m on Drift glacier. On 2 November a slushy debris-flow originated near the 1966-68 vent. On 5 November AVO raised the Aviation Color Code for Redoubt from Green to Yellow and the Volcano Alert Level from Normal to Advisory because of significant changes in gas emission and heat output during the previous several months. The changes were a departure from the long-observed background activity. In early November, AVO staff began to install additional geophysical equipment and a web camera on the volcano. Since November, seismic activity has remained low, although the number of low-frequency earthquakes during the previous several months had increased modestly. On 16 December a short-lived steam cloud, rising no higher than the volcano's summit, was reported by an observer in Kenai, 82 km E of the volcano. Clear satellite views during 12-16 December showed nothing unusual. As of 23 December 2008, the Current Aviation Color Code and Vocano Alert Level remained at Yellow and Advisory, respectively. 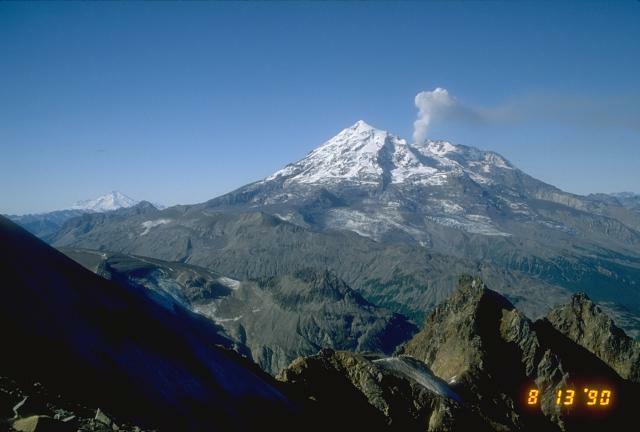 The previous eruption of Redoubt that began on 14 December 1989 (SEAN 14:11) lasted until June 1990. On 15 March 2009, an eruption again occurred, after changes in gas emissions, seismicity, and heat output were noted during the previous 8 months (BGVN 33:11). As background, in late July 2008, Alaska Volcano Observatory (AVO) crews working near the summit smelled hydrogen sulfide (H2S) gas. About a month later, a pilot reported a strong sulfur-dioxide (SO2) odor, and nearby residents heard noises coming from the direction of Redoubt. Scientists also observed several fractures and circular openings in the upper Drift Glacier, and they found fumaroles atop the 1968 and 1990 lava domes more vigorous than when last observed in mid-August 2008. On 13 October 2008, satellite instruments detected warming at the summit, and on 2 November a slushy debris-flow originated near the 1966-68 vent. On 16 December 2008 a short-lived steam cloud rose no higher than the volcano's summit. The rest of this report discusses unrest starting in late January 2009, and gives a brief overview of the eruption from the first ash-bearing explosions detected on 15 March, through those continuing during mid-May. Figure 18 shows a map of the area; the volcano sits along the Cook Inlet ~ 80 km WSW of Anchorage (see also figure 12 in BGVN 15:04; and Waythomas and others, 1998). Figure 18. Shaded relief map of the Redoubt area, indicating both the Drift river and the oil terminal with the same name. A sketch map of the Drift river oil terminal. Base maps courtesy of Google Maps; feature locations courtesy of USGS-AVO. During 24-25 January 2009, Redoubt's seismicity increased markedly and steam and sulfurous gases were noted. On 25 January, tremor became sustained and amplitude increased notably. Steaming increased at previously identified vent areas in the snow and ice cover, which also emitted sulfurous gas. 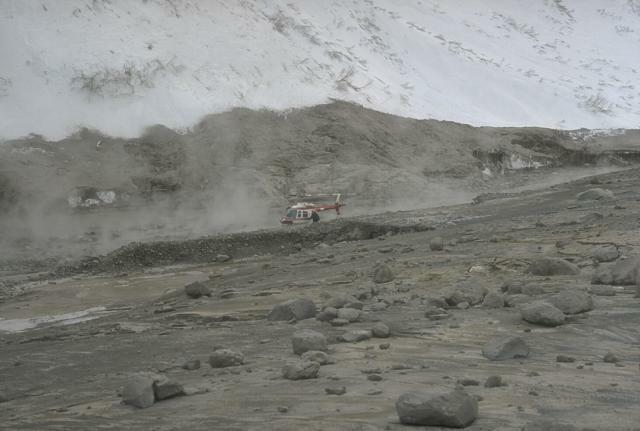 An overflight on 26 January revealed elevated SO2 emissions from the summit and new outflows of muddy debris along the glacier that is downslope of the summit. Seismicity was variable during the last few days of January extending into early March, but it remained above background levels. Observations revealed increased fumarolic activity, enlarged melt features in the summit glacier, and increased runoff from along the margins of the Drift glacier, which feeds the river system of the same name down Redoubt's N-flank (figure 18). Steam plumes within the summit crater were seen on the web camera. The 2009 eruption began with a minor ash-and-steam explosion just after 1300 on 15 March; major explosions began at about 2240. The emissions originated from a new vent, located just S of the 1990 lava dome and W of the prominent ice collapse feature near the N edge of the summit crater. A sediment-laden flow occurred from a small area in the ice on the upper part of Drift glacier (figure 19). Figure 19. Photograph of Redoubt's N face taken about 35 minutes after the ash burst of 15 March 2009 during a monitoring flight. A dark area of fresh ash deposits lies on top of the snow on the sloping crater floor. In front of that a gas plume escapes from a vent near the crater rim. The sinuous dark stripe in the foreground is a watery debris flow that emerged from beneath the ice about 20 minutes after the ash event. Photo by Heather Bleick; courtesy of USGS-AVO. 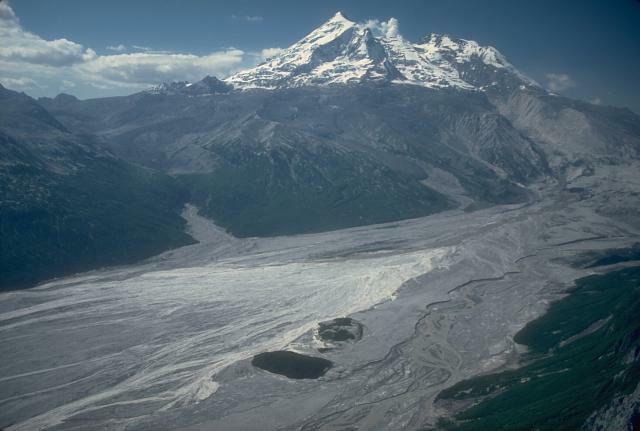 The eruptions caused melting of the Drift Glacier and greatly increased discharge, causing lahars in the Drift River that traveled more than 35 km, reaching the Cook Inlet. On 23 March, AVO staff saw large lahar and flood deposits in the Drift River valley. In the middle to upper Drift River valley, high-water marks reached 6-8 m above the valley floor. Some of these deposits were observed on 30 April (figure 20). Figure 20. Image taken on 30 April 2009 showing several the large blocks of glacial ice deposited in the Drift River valley during the flood caused by the eruptive event on 4 April 2009. The N shoulder of the western end of Dumbbell Hills is on left side of image. The high-water mark near this site was nearly 10 m. Note the geologist standing to the left of the largest block for scale. Photo by Game McGimsey, courtesy of USGS-AVO. Several of the explosions resulted in ashfall in several populated areas, as far away as Delta Junction (~ 545 km NE). More significant ashfall occurred in more contiguous areas, including the Matanuska-Susitna Valley, the Kenai Peninsula and the Anchorage bowl. Satellite images showed a broad layer of volcanic haze that extended over these areas. On 22 March, ashfall was reported in areas 190-250 km NE. According to a 29 March Associated Press article, flights in and out of Anchorage and other local areas were canceled or diverted during 24-28 March. As many as 185 Alaska Airlines flights had been canceled since the beginning of the eruption; airports and other airlines also experienced service disruptions. The maximum thickness of ashfall measured in a populated area was about 1.5 mm near Seldovia, following the 4 April explosion. A measurement of about 3 mm, following the explosion on 26 March, was recorded near Silver Salmon Creek Lodge, about 48 km S. Trace ashfall was also observed between explosive events, during times when the volcano emitted continuous low-altitude (under 4.6 km) gas-and-ash plumes. On 30 March a thermal anomaly at the vent seen on satellite imagery was caused by the extrusion of a lava dome in the summit crater (confirmed by AVO on 3 April). Observers also recognized that the dome had already began spilling occasional avalanches of hot blocks a short distance down the N flank. Observations on 9 April determined that the lava dome, which had grown in the same location as the previous one, was circular in shape, and 400 m in diameter. By 16 April, the lava dome was estimated to be about 500 x 700 m across and at least 50 m thick (figure 21). A volume estimate of the still-expanding dome made during 29 April-5 May suggested a volume of 25-30 million cubic meters. Figure 21. Image from 16 April 2009 of the active lava dome that grew in Redoubt's summit crater. The steam plume near the base of the dome comes from a pocket where abundant hot blocks shedding off the dome accumulated. The waterfall (dark area in lower part of photo) is ~ 75 m high. Photo by Game McGimsey, courtesy of USGS-AVO. After the last explosion detected on 4 April and until mid-May, small steam-and-gas plumes occasionally containing some ash were seen on satellite imagery and on the web camera. Elevated seismicity and satellite imagery indicated that the lava dome continued to grow. SO2 plumes were also detected by satellite imagery. Occasional rockfalls originating from the lava dome's flanks were observed on the web camera. Reference. Waythomas, C.F., Dorava, J.M., Miller, T.M., Neal, C.A., and McGimsey, R.A., 1998, Preliminary volcano-hazard assessment for Redoubt volcano, Alaska: USGS Open File report 97-857, plate 1. Information Contacts: Alaska Volcano Observatory (AVO), a cooperative program of a) U.S. Geological Survey, 4200 University Drive, Anchorage, AK 99508-4667, USA (URL: http://www.avo.alaska.edu/), b) Geophysical Institute, University of Alaska, PO Box 757320, Fairbanks, AK 99775-7320, USA, and c) Alaska Division of Geological & Geophysical Surveys, 794 University Ave., Suite 200, Fairbanks, AK 99709, USA; Associated Press (URL: http://www.ap.org/). Redoubt is a 3108-m-high glacier-covered stratovolcano with a breached summit crater in Lake Clark National Park about 170 km SW of Anchorage. 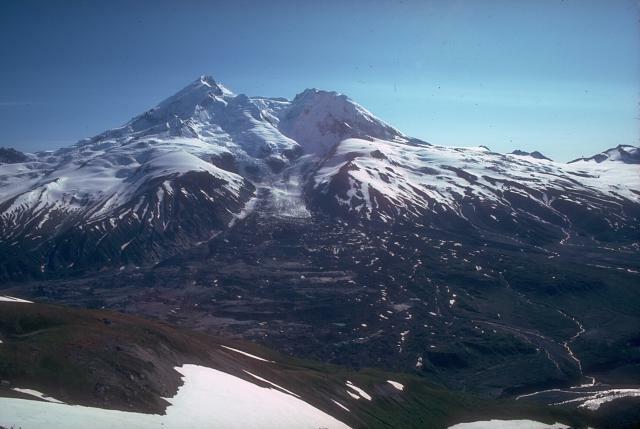 Next to Mount Spurr, Redoubt has been the most active Holocene volcano in the upper Cook Inlet. The volcano was constructed beginning about 890,000 years ago over Mesozoic granitic rocks of the Alaska-Aleutian Range batholith. Collapse of the summit of Redoubt 10,500-13,000 years ago produced a major debris avalanche that reached Cook Inlet. Holocene activity has included the emplacement of a large debris avalanche and clay-rich lahars that dammed Lake Crescent on the south side and reached Cook Inlet about 3500 years ago. Eruptions during the past few centuries have affected only the Drift River drainage on the north. Historical eruptions have originated from a vent at the north end of the 1.8-km-wide breached summit crater. The 1989-90 eruption of Redoubt had severe economic impact on the Cook Inlet region and affected air traffic far beyond the volcano. Beget J E, Nye C J, 1994. Postglacial eruption history of Mt. Redoubt, Alaska. J. Volcanol. Geotherm. Res., 62: 31-54. Brantley S R (ed), 1990. The eruptions of Redoubt volcano, Alaska December 14, 1989 - August 31, 1990. U S Geol Surv Circ, 1061: 1-33. Gardner C A, Neal C A, Waitt R B, Janda R J, 1994. Proximal pyroclastic deposits from the 1989-1990 eruption of Redoubt volcano Alaska--stratigraphy, distribution, and physical characteristics. J. Volcanol. Geotherm. Res., 62: 213-250. Miller T P, 1994. Dome growth and destruction during the 1989-1990 eruption of Redoubt volcano. J. Volcanol. Geotherm. Res., 62: 197-212. Miller T P, Chouet B A, 1994. The 1989-1990 eruptions of Redoubt volcano: an introduction. J. Volcanol. Geotherm. Res., 61: 1-10. Schiff C J, Kaufman D S, Wallace K L, Ketterer M E, 2010. An improved proximal tephrochronology for Redoubt Volcano, Alaska. J. Volcanol. Geotherm. Res., 193: 203-214. Scott W E, McGimsey R G, 1994. Character, mass, distribution, and origin of tephra-fall deposits of the 1989-1990 eruption of Redoubt volcano, Alaska. J. Volcanol. Geotherm. Res., 62: 251-172. Till A B, Yount M E, Bevier M L, 1994. The geologic history of Redoubt volcano, Alaska. J. Volcanol. Geotherm. Res., 62: 11-30. Waythomas C F, Dorava J M, Miller T P, Neal C A, McGimsey R G, 1998. Preliminary volcano-hazard assessment for Redoubt volcano, Alaska. U S Geol Surv Open-File Rpt, 97-857: 1-40. There is data available for 101 Holocene eruptive periods. Remarks: GPS data prior to the March 2009 eruption show subtle motion radially outward from the volcano beginning as early as May 2008. InSAR does not detect this motion. Reference List: Grapenthin et al. 2013. Mount Redoubt rises to 3108 m on the west side of Cook Inlet, 170 km SW of Anchorage. Redoubt volcano was constructed over a basement of glacially eroded Mesozoic granitic rocks, seen here in the foreground. The volcano has been very active during the Holocene, producing at least 30 tephra layers in the Cook Inlet basin stratigraphy. A steam plume rises from the summit crater, which is breached to the north, in this view from the NE following its 1989-90 eruption. Iliamna volcano is visible in the left distance. Photo by Christina Neal (U.S. Geological Survey, Alaska Volcano Observatory). 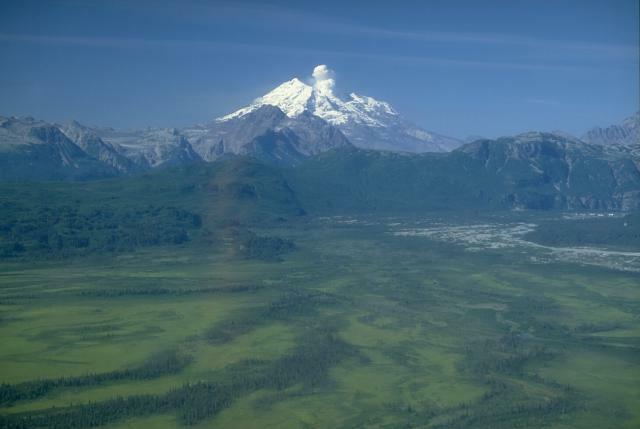 Glacier-covered Mount Redoubt towers above the green, flat-bottomed floor of the Drift River valley NE of the volcano. The summit crater of Redoubt is breached to the north and has funneled eruptive products into the Drift River valley. Steam rises from the crater in this 1990 photo after the end of the 1989-90 eruption. Photo by Cynthia Gardner, 1990 (U.S. Geological Survey). Redoubt Volcano, 3108 m high, and one of the two most active volcanoes of the upper Cook Inlet region, is viewed here from the north in 1980. The breached summit crater is drained by Drift glacier, which empties into the Drift River valley forming a piedmont lobe. Thick andesitic lava flows cap the summit, and Holocene lahars have filled the Drift River valley on the NE and Crecent River valley on the SE. Photo by Allison Till, 1980 (Alaska Volcano Observatory, U.S. Geological Survey). 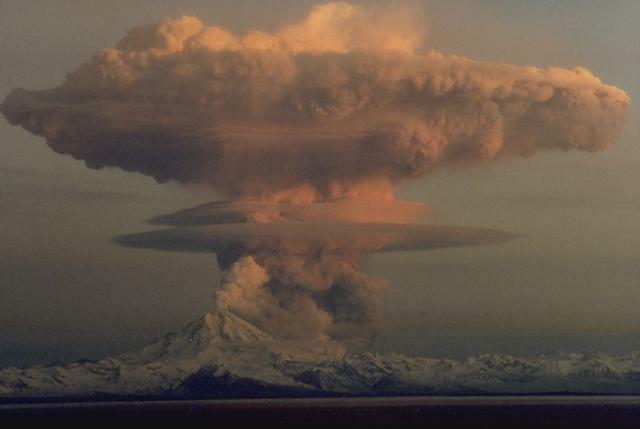 Continuous, low-level eruptions of steam and ash rise above Redoubt volcano on December 18, 1989. The 1989 eruption began with a major explosion on the 14th of December that opened a new vent in the summit crater. A lava dome began growing in the new vent but was destroyed again and again by intermittent explosive eruptions. Pyroclastic flows and mudflows repeatedly traveled down the Drift River valley to the north and NE. Photo by W. White, 1989 (Alaska Volcano Observatory, U.S. Geological Survey). The 1989-90 eruption of Redoubt Volcano was characterized by repeated growth and destruction of lava domes above a vent on steep slopes in the summit crater. This view from the north on February 2, 1990, shows the second largest lava dome, which was destroyed during an explosive eruption on February 15, 1990. 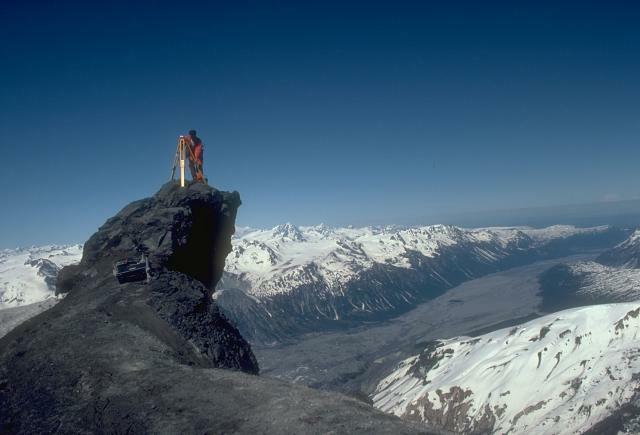 Photo by Game McGimsey, 1990 (Alaska Volcano Observatory, U.S. Geological Survey). 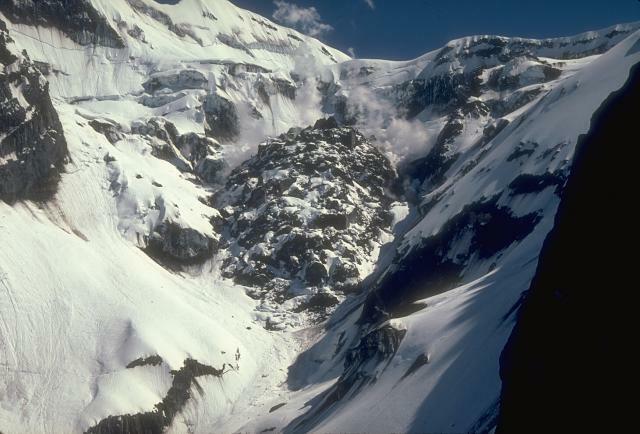 Hot debris avalanching down the steep north flank of Redoubt Volcano during the 1989-90 eruptions mixed with water derived from melted snow and ice to form lahars. These sediment-rich floods carried steaming debris many kilometers down the Drift River Valley. The top of the gray area marks the "high-water" line of the lahar that contrasts with the snow-covered slopes above it. Photo by Tom Miller, 1990 (Alaska Volcano Observatory, U.S. Geological Survey). Lahars that formed during the 1989-90 eruptions of Redoubt Volcano in Alaska accumulated in the Drift River Valley NE of the volcano. The largest lahars, such as this one from the February 15, 1990 eruption, covered the valley floor nearly wall-to-wall and extended more than 35 km to the Cook Inlet. Lahars from the 1989-90 eruptions of Redoubt volcano inundated a few structures in their direct path. The largest lahars traveled 35 km down the Drift River valley NE of the volcano and reached Cook Inlet. An aerial view shows the floor of the upper Drift River valley following the 1989-90 eruptions of Redoubt Volcano. Two bedrock islands (informally called the "Dumbbell Hills") are visible at bottom center, surrounded by fresh lahar deposits. This photo was taken from the NE on June 28, 1990, shortly after the end of the eruption. 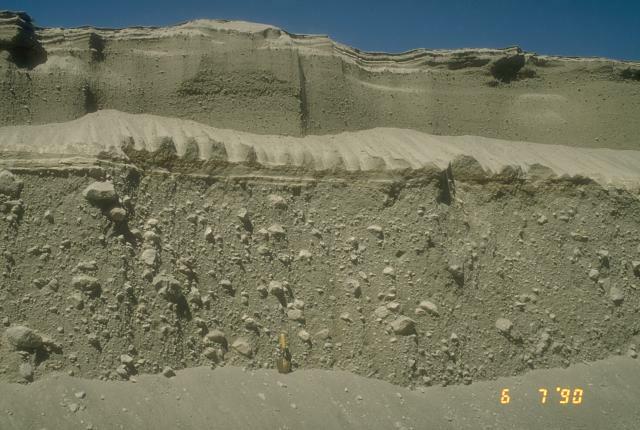 Pyroclastic-flow deposits from the April 15 (lower 2/3 of section) and April 21 (upper 1/3 of section), 1990 eruptions of Redoubt Volcano in Alaska are exposed in a gully along the western margin of the piedmont lobe of Drift glacier. The shovel at the base of the section provides scale. The somewhat larger April 15 pyroclastic flow carried large blocky fragments of a lava dome that had been growing in the summit crater. Photo by Christina Neal, 1990 (Alaska Volcano Observatory, U.S. Geological Survey). 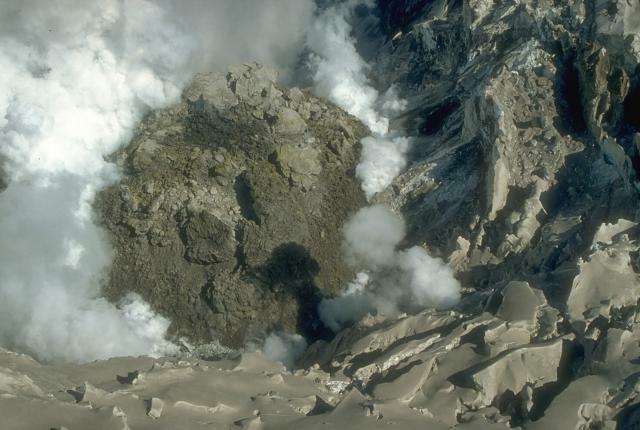 The south face of the final lava dome produced during Redoubt's 1989-90 eruptions is seen on June 1, 1990, during the waning phases of eruption in the summit crater. A fractured lobe of blocky lava is visible at center. Steam from interaction of meltwater with hot rock billows from the margins of the lava dome. Remnant glacial ice with a coating of gray ash surrounds the dome. This oblique view from the north shows the final lava dome of the 1989-90 eruption of Alaska's Redoubt Volcano as it appeared approximately one year after the end of the eruption. The dome measures approximately 350-400 m across and represents an estimated 10 million cubic meters of material. Snow is accumulating on the cooling lava blocks although some hydrothermal activity continues to produce intermittent steam plumes. Periodic lava dome growth during the eruption was punctuated by strong explosions that destroyed earlier lava domes. A dramatic, mushroom-shaped eruption column, lit by the rising sun, rises above Alaska's Redoubt volcano on April 21, 1990. 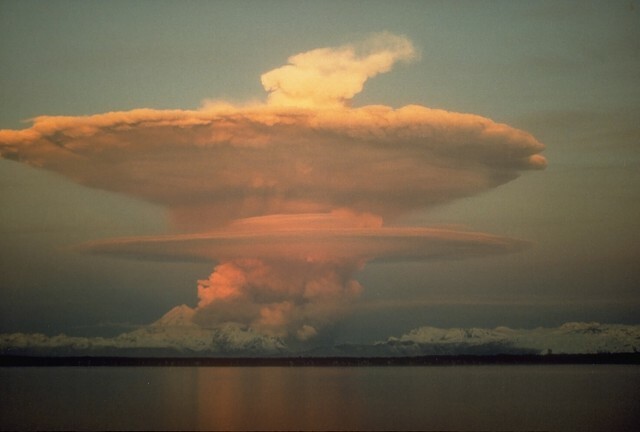 Clouds of this shape, which are produced when the upper part of an eruption column attains neutral buoyancy and is spread out above the troposphere-stratosphere boundary, are common during powerful explosive eruptions. This column at Redoubt, however, did not originate from an eruption at the summit crater, but is an ash column that is rising buoyantly above a pyroclastic flow sweeping down the volcano's north flank. Photo by Joyce Warren, 1990 (courtesy of U.S. Geological Survey). A series of powerful eruptions began on December 14, 1989, from Redoubt volcano. This December 18 view from the Kenai Peninsula across Cook Inlet shows a mushroom-shaped ash cloud that appears to originate from a vent on the north flank of Redoubt but is actually ash that is convecting above the surface of a pyroclastic flow that is moving down the Drift River valley to the north. Ash columns during the initial days of the eruption reached heights of about 10 km. Several episodes of strong explosive activity and lava dome growth lasted until June. Copyrighted photo by Robert Clucas, 1990. 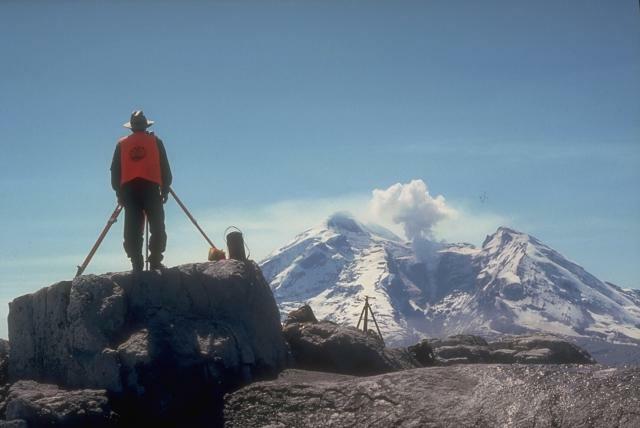 An Alaska Volcano Observatory geologist uses a laser-surveying instrument to measure distances to targets installed on the flanks of Redoubt Volcano. Minute changes in distances to the targets can reflect ground deformation that may indicate magma movement. Steam rises above a lava dome in the crater of Redoubt in this photo taken on May 5, 1990, near the end of an eruption that had begun the previous December. An Alaska Volcano Observatory geologist sets up GPS (Global Positioning System) instrumentation on the north flank of Redoubt Volcano. The GPS receiver calculates an extremely accurate location through satellite-based triangulation. This helps pinpoint locations for electronic distance measurements that detect deformation of the volcano related to eruptive activity. The Drift River valley extending away from the volcano to the NE was covered with pyroclastic-flow and mudflow deposits from the 1989-90 eruption. There are no samples for Redoubt in the Smithsonian's NMNH Department of Mineral Sciences Rock and Ore collection. IRIS seismic stations/networks Incorporated Research Institutions for Seismology (IRIS) Data Services map showing the location of seismic stations from all available networks (permanent or temporary) within a radius of 0.18° (about 20 km at mid-latitudes) from the given location of Redoubt. Users can customize a variety of filters and options in the left panel. Note that if there are no stations are known the map will default to show the entire world with a "No data matched request" error notice. Large Eruptions of Redoubt Information about large Quaternary eruptions (VEI >= 4) is cataloged in the Large Magnitude Explosive Volcanic Eruptions (LaMEVE) database of the Volcano Global Risk Identification and Analysis Project (VOGRIPA).